Reminder: all ancient Egyptian names are simply modern transliterations of how we think the Egyptians would say their names. There will therefore be some inconsistency in spellings, depending on where information comes from. There may even be inconsistencies within this web site. This is something of which I am aware and something that I don't really care about. You shouldn't care either: keep an open mind. The curse of the Pharaohs legend has some basis. 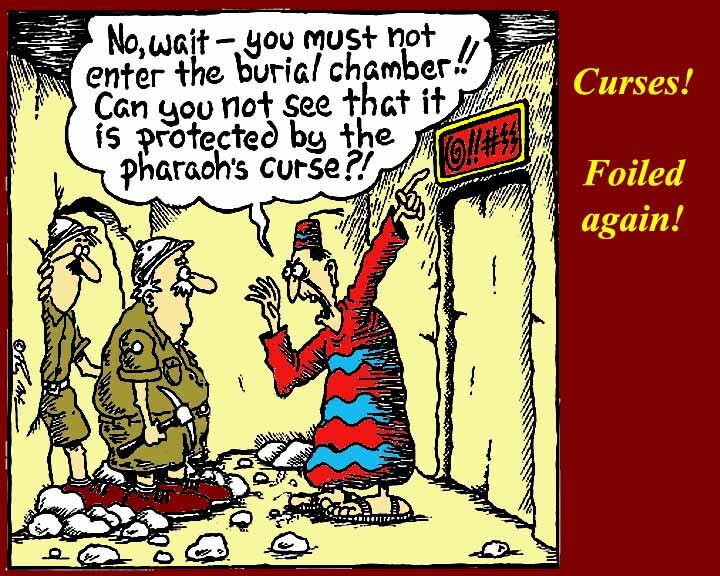 The ancient Egyptians believed in curses, so they really did call on the gods to bring disaster on anyone who disturbed their mummies. Many tombs had inscriptions, but they weren't necessarily curses. Sometimes the ancient Egyptians, who were animists, simply put words in the "mouth" of a guardian statue describing its function. 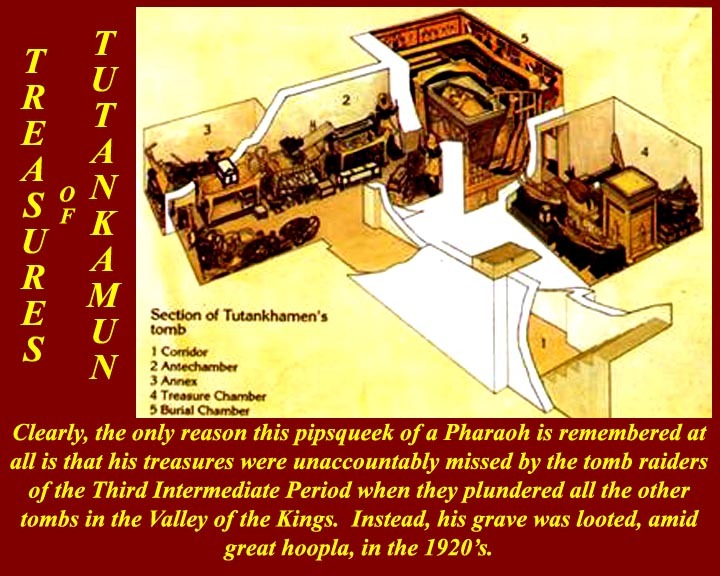 The supposed curse in Tutankhamen's tomb really read: "It is I who hinder the sand from choking the secret chamber. I am for the protection of the deceased". This was correctly reported to the public, but one newspaper reporter added his own words to the inscription: "and I will kill all those who cross this threshold into the sacred precincts of the Royal King who lives forever." For more information on the Mummy's Curse, see http://www.touregypt.net/featurestories/curse.htm. All countries mark off their histories by the reign of important rulers. We in the US, for example, remember and even compose legends, about certain presidents and pretty much forget the rest. (What do we know about President Harrison? How many know there were two Presidents Harrison?) 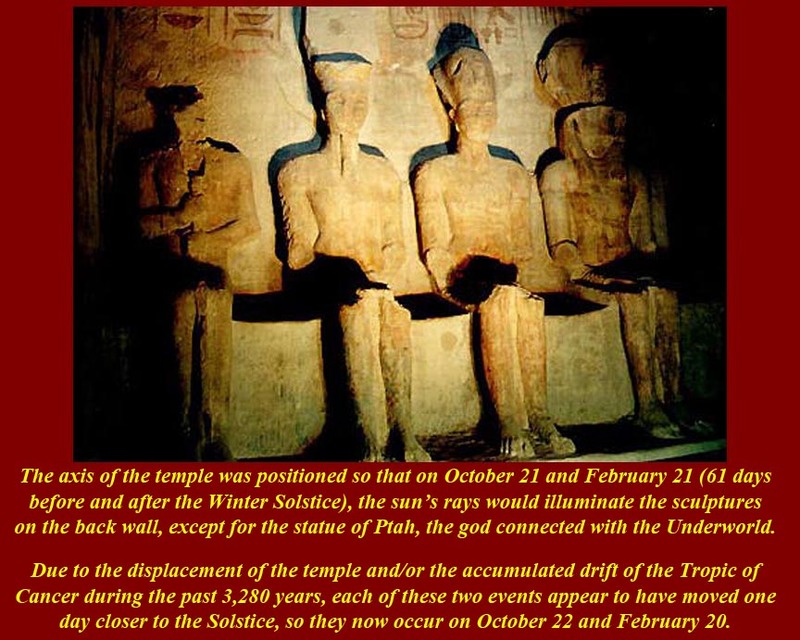 The ancient Egyptians were no different, and thousands of years of intervening history will have obscured some Pharaohs that they thought were important. 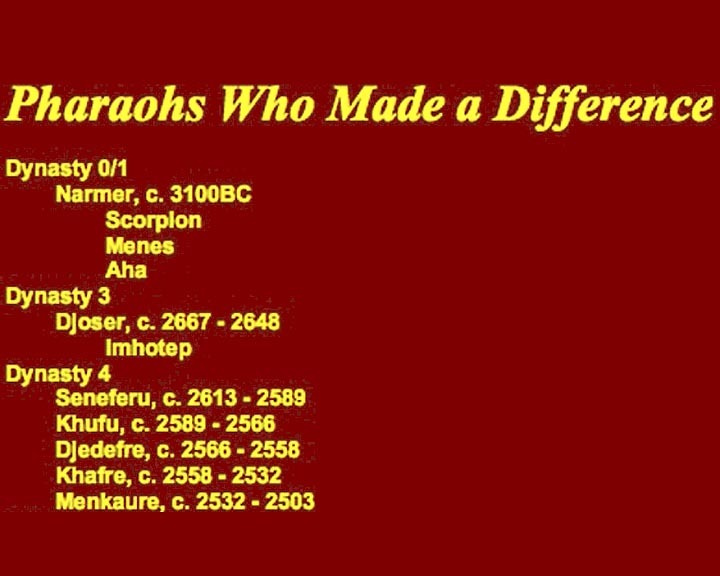 The above lists are some Pharaohs whose names might ring a bell today. 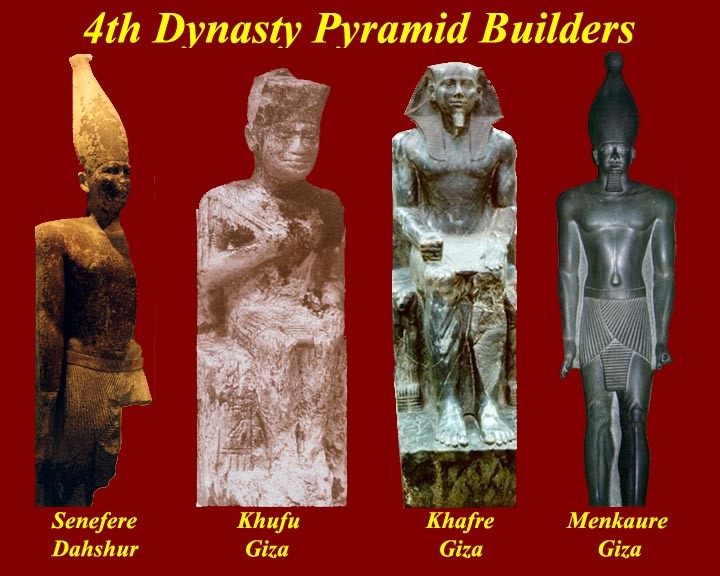 For more than you ever wanted to know about all the Pharaohs, visit http://www.touregypt.net/kings.htm. And for the official version of US presidential biographies, see http://www.whitehouse.gov/history/presidents/. 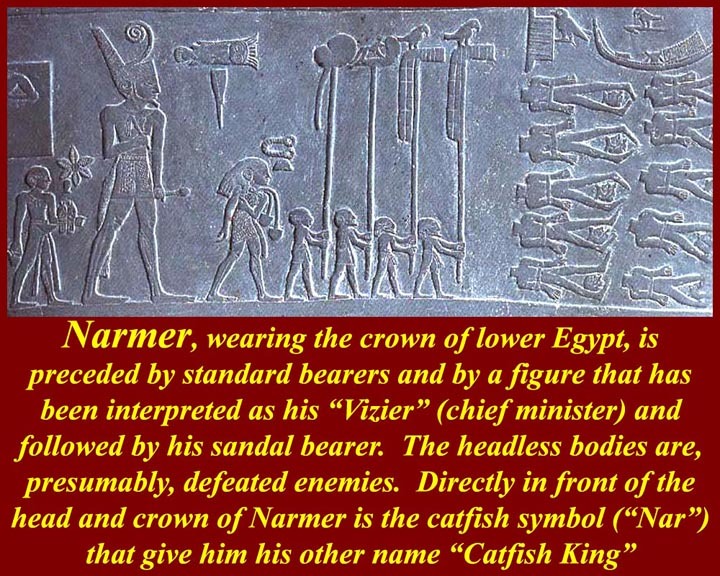 Narmer ruled about 3100 BC and is generally recognized as the Pharaoh who unified ancient Egypt -- although there are some name difficulties in the sources. He is, in fact, at least semi-legendary. 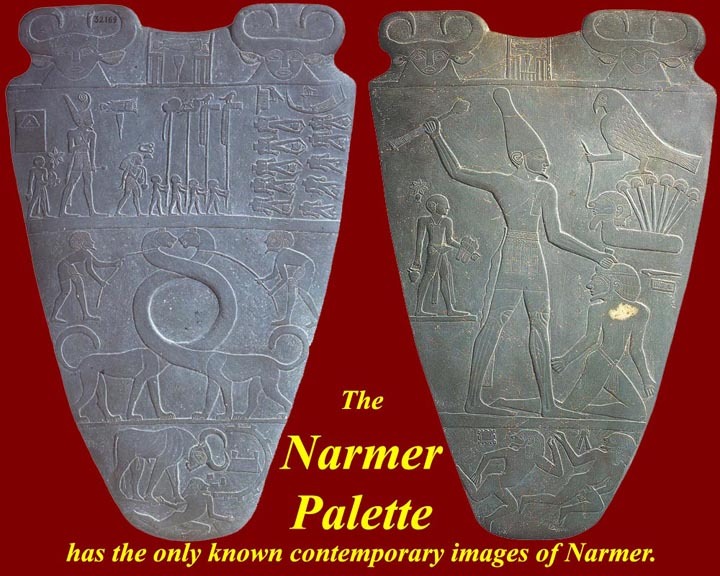 We have the Narmer palette, shown above, the Narmer mace, a few marked stones and potsherds. 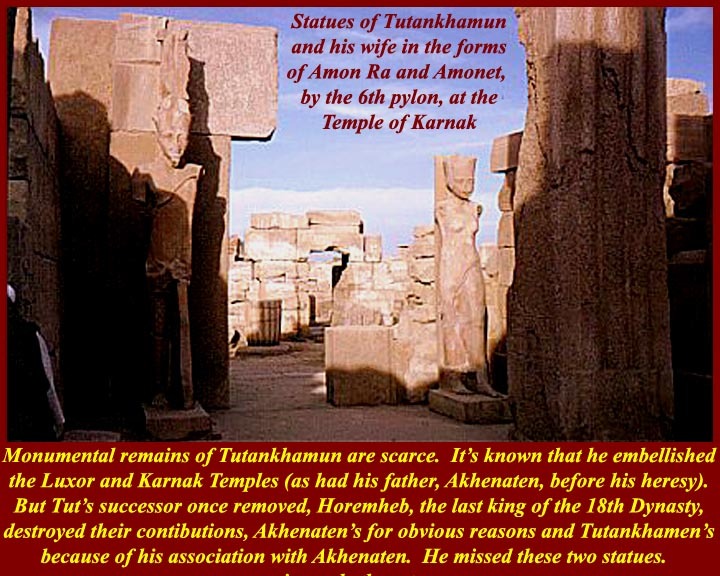 For information on his capital, Hierakonpolis, see http://www.archaeology.org/interactive/hierakonpolis/temple.html. 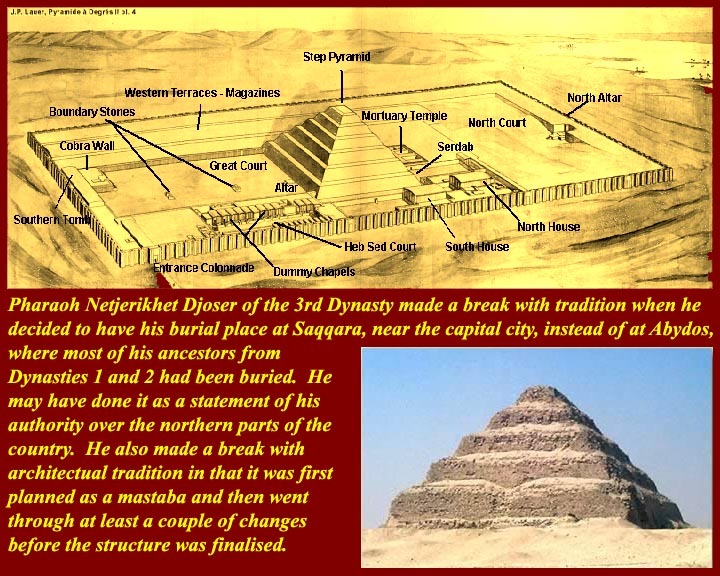 Djoser's claim to fame is that he commissioned the first known pyramid and certainly the first really big pyramid. 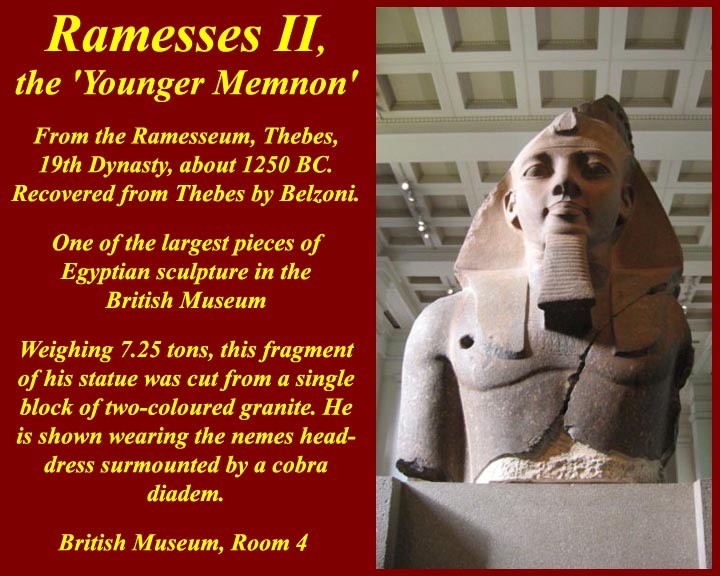 He was the 2nd pharaoh of the 3rd Dynasty (ruled c. 2667 - 2648 BC). 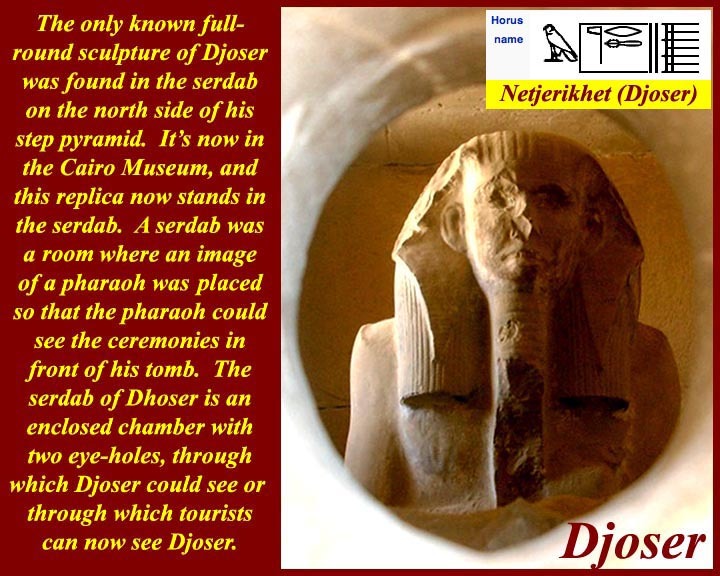 The Djoser statue shown is from his serdab (see below) and is now in the Cairo Egyptian Museum. 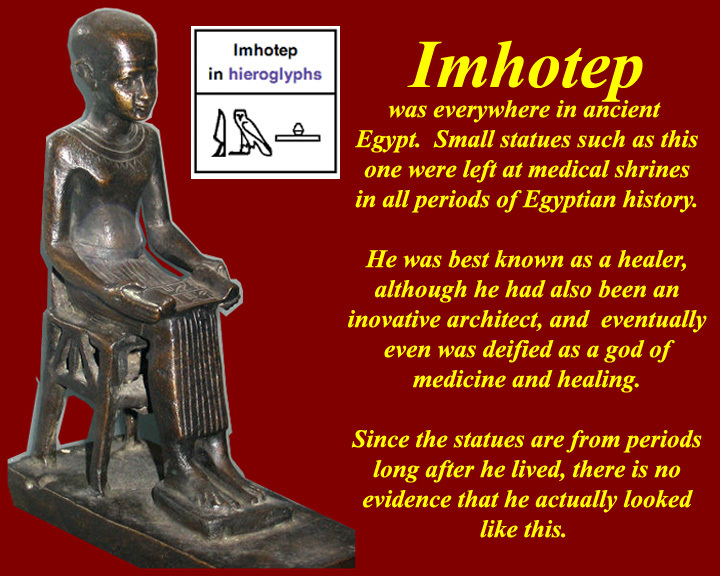 Djoser's architect, Imhotep, was one of the best know Egyptians in ancient times, but not for his architecture: he was eventually deified as a god of medicine. 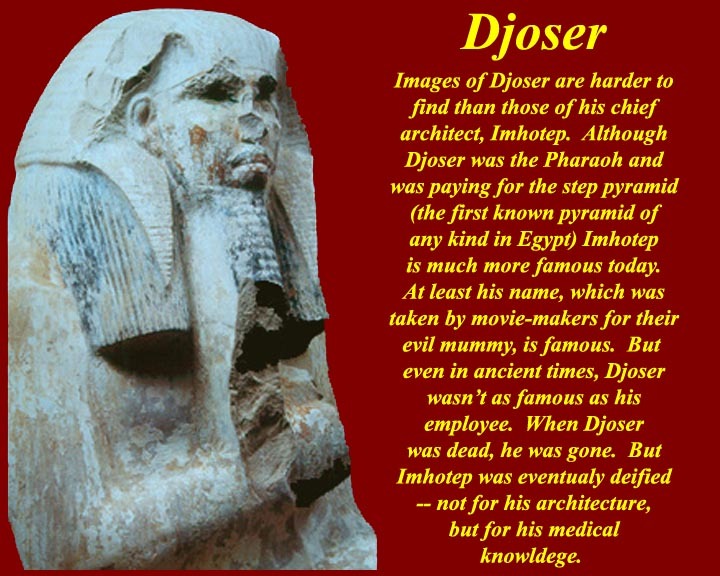 Internet searches for Djoser and the most popular alternative spelling Zoser turned up almost 800 thousand links. 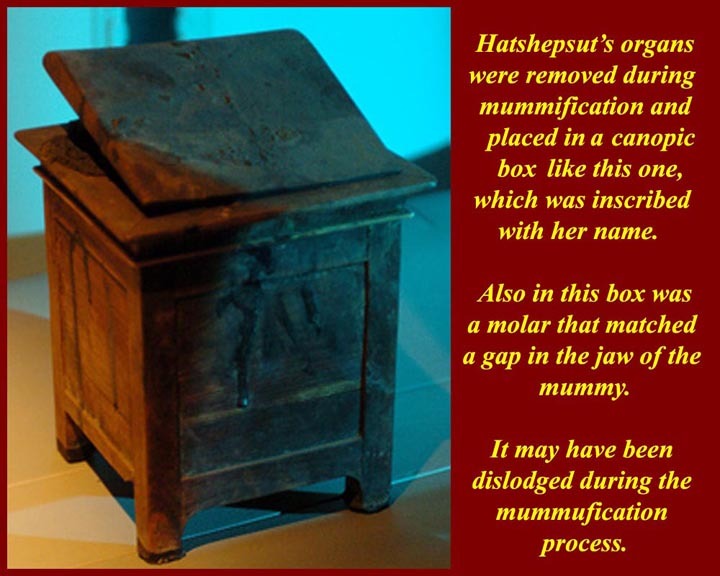 The name Imhotep was also used for the villain in many mummy movies, so internet searches for his name are somewhat contaminated. 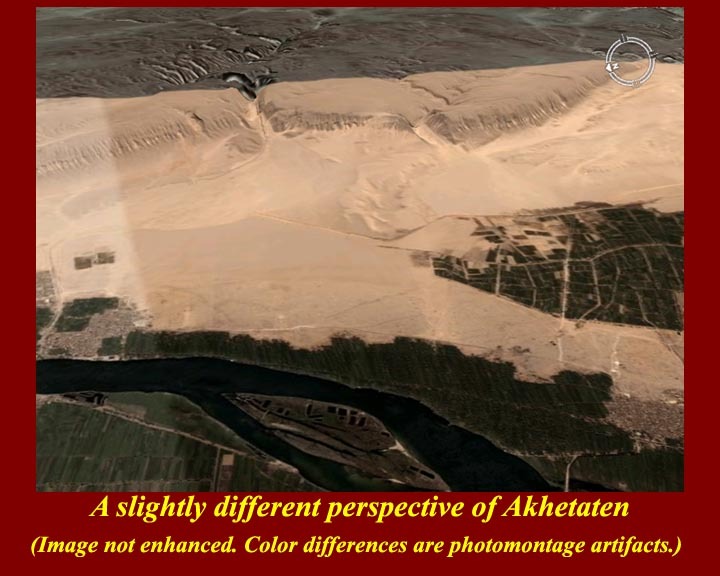 The first image shows a scholarly reproduction of the appearance of Djoser's pyramid complex when it was built and how the pyramid looks today. See http://www.touregypt.net/featurestories/dsteppyramid1.htm for much more information. The second image was shot through one of two small holes in the serdab at the north side of Djoser's pyramid. A serdab was an enclosed room from which the deceased (personified in an image) could view ceremonies associated with the funeral and later commemorations, and so the two holes in the front of Djoser's serdab were put there so he could look out. Today they are used by thousands of tourists to look in at a replica of his statue that was found there. 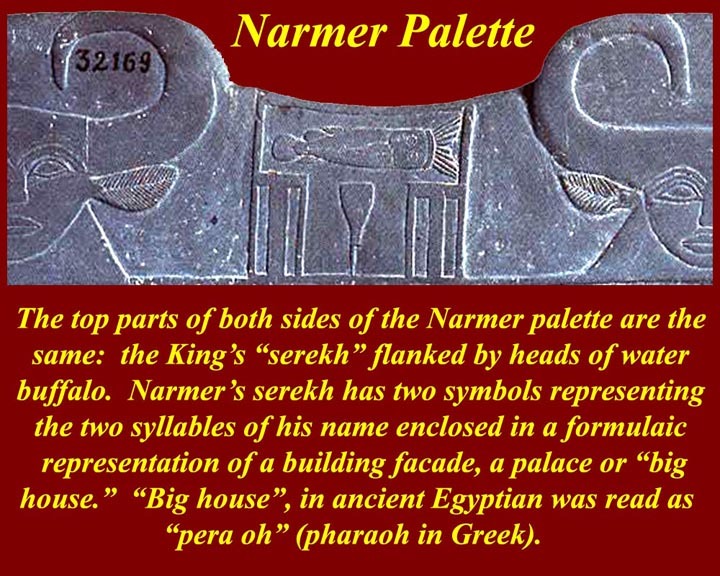 Djoser's serdab is explained at http://www.touregypt.net/featurestories/dsteppyramid3.htm. 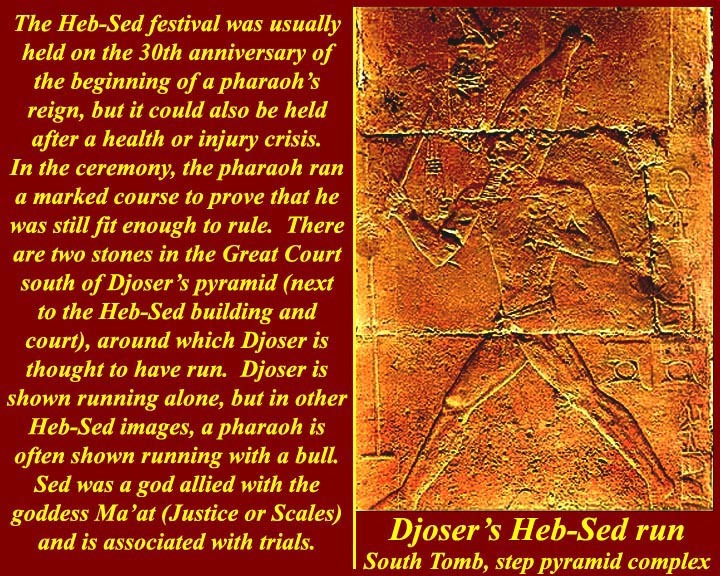 The third image shows Djoser running in his Heb-Sed ceremony. The Heb-Sed ritual nominally took place in the 30th year of a ruler's reign and was a trial of his or her physical capability to continue to rule. This image is heavily processed for contrast when projected. An image of the actual appearance of the relief is at http://www.touregypt.net/featurestories/sedfestival.htm, where there is also a short explanation of the festival. 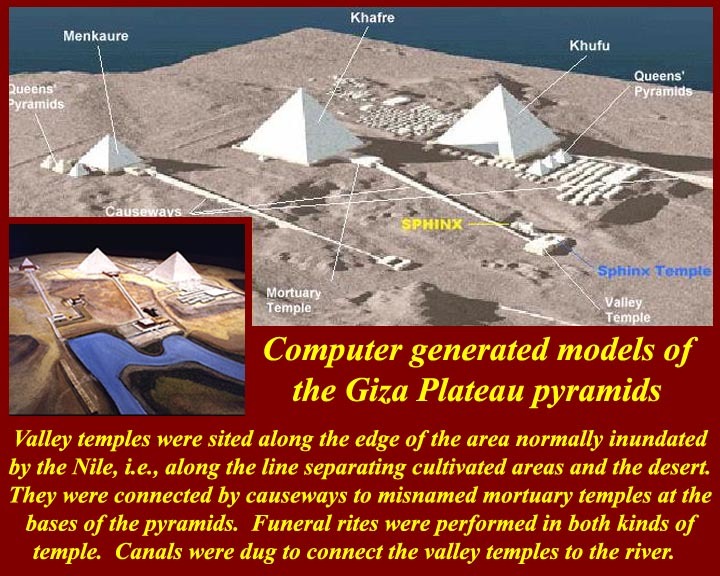 The 4th Dynasty (c. 2613 - 2494) was the time of really big pyramids. Senefru, the first ruler of the dynasty built three. The first collapsed just as it was being finished. The second was the Bent Pyramid which had to be altered ("bent" inward) during construction, to keep it from falling. The third, the Red Pyramid, which is considered to be the first "true" pyramid was built at a shallower angle (see below). 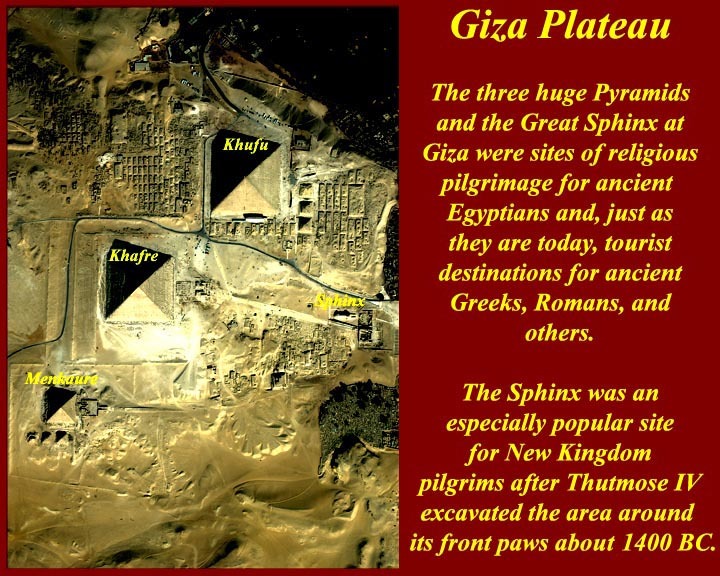 Members of his family, Khufu, Khafre, and Menkaure, built the three great pyramids at Giza, and Khafre (probably) also built the Great Sphinx. For more on Pyramids, see http://www.mmdtkw.org/EGtkw0600-Pyramids.html, a later unit in this course, and http://www.touregypt.net/featurestories/pyramids.htm. 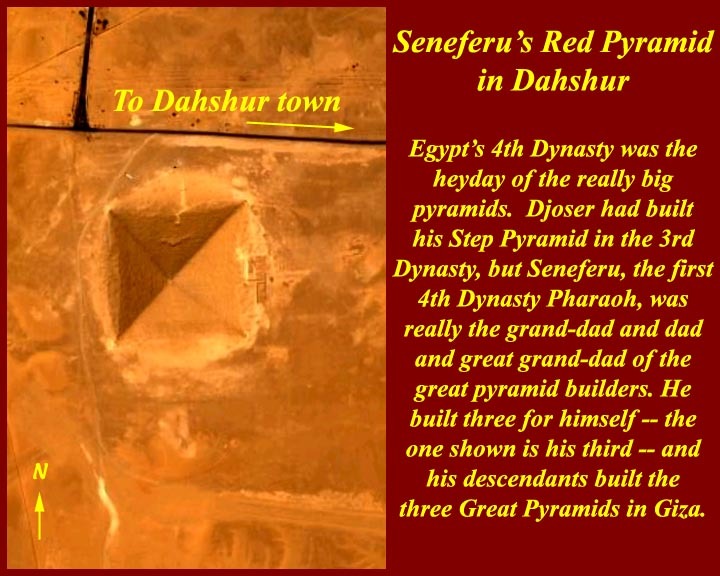 Senefru's Red Pyramid at Dahshur is actually just a little bit pinkish, the color of the core stone. It was designed to be white, but the outer white stone all was taken away for later uses. 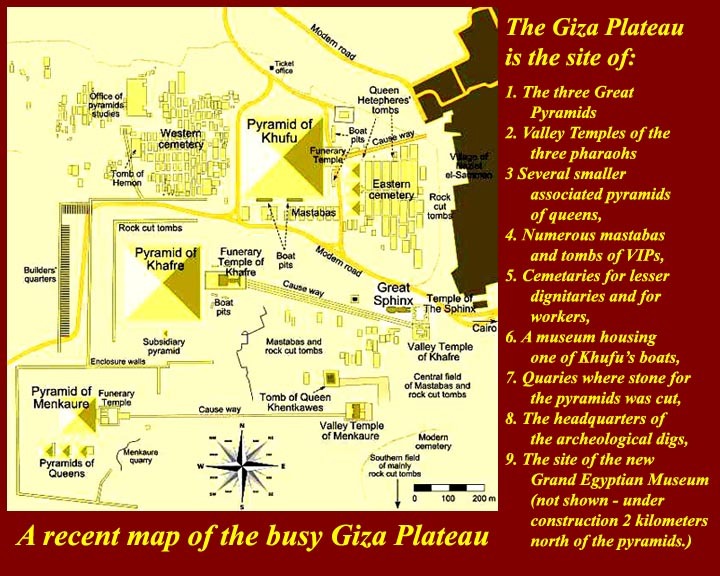 A map and a satellite image of the Giza plateau show the locations of the more important monuments. 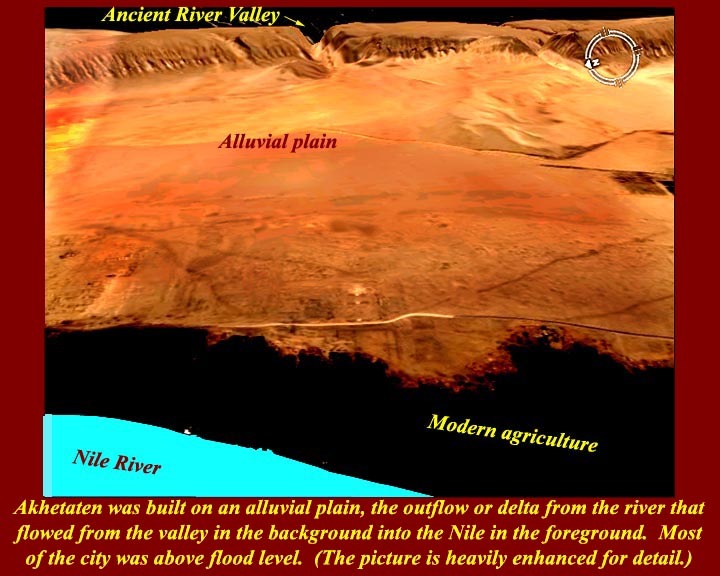 The third image also shows how canals connected the Valley Temples of the Pyramids to the Nile. Valley temples were built above the inundation water line, i.e., behind the cultivable area next to the river. For information about the Giza Plateau, visit the web site of the Giza Plateau Mapping Project at http://oi.uchicago.edu/research/projects/giz/. 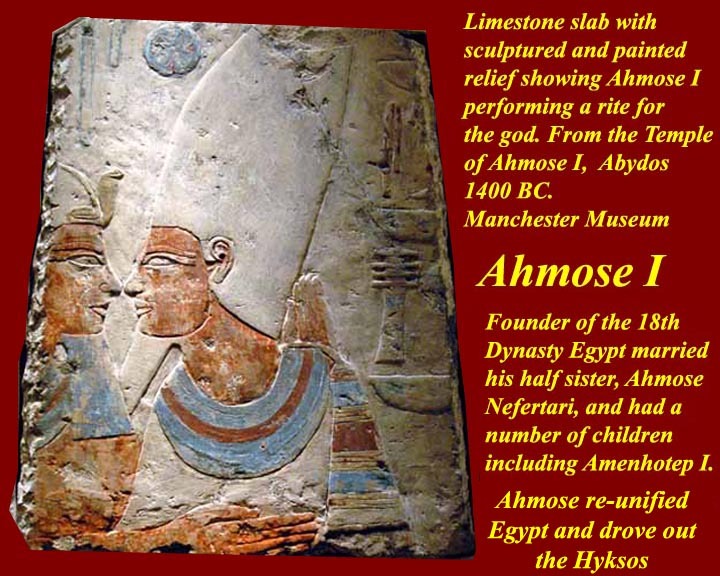 Ahmose I kicked out the Hyksos and established the 18th Dynasty, which begins what modern scholarship calls the New Kingdom of ancient Egypt. He became Pharaoh in about 1550 BC, probably when he was about ten years old, after his father and older brother died. In the first years of his reign, it is probable that his mother, Queen Ashotep ruled with him, but by his tenth regnal year he was actively pursuing war against the Hyksos. By the time he died in his 25th regnal year, the Hyksos were gone, and Egypt was again unified under a native Egyptian pharaoh. 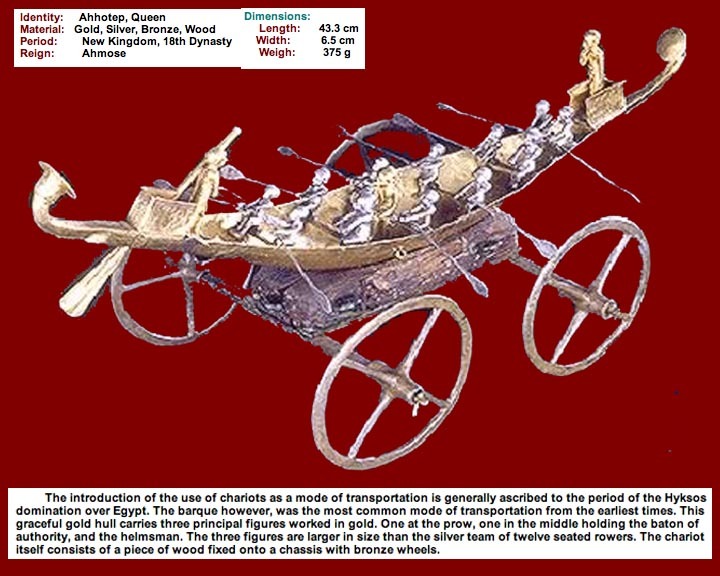 The key to his success was the ability of his ruling family at Thebes to adopt and improve on Hyksos military technology: bronze weapons, compound recurved archery bows, chariots, etc. 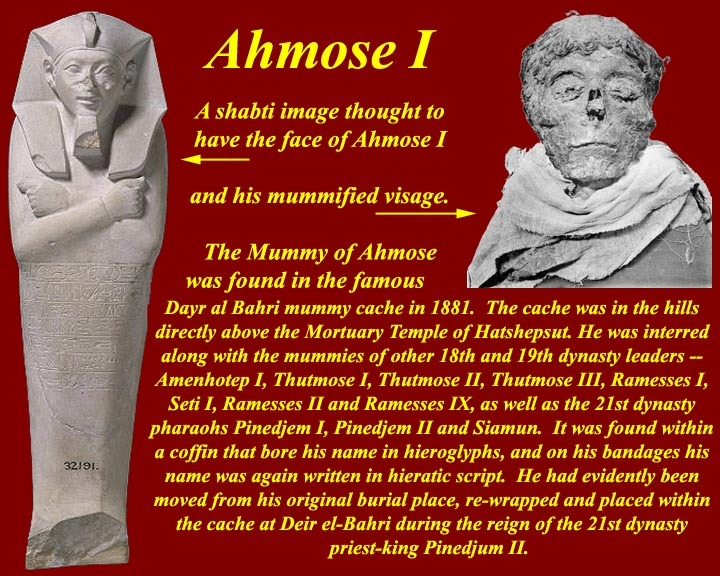 For more on Ahmose I, see http://en.wikipedia.org/wiki/Ahmose_I. 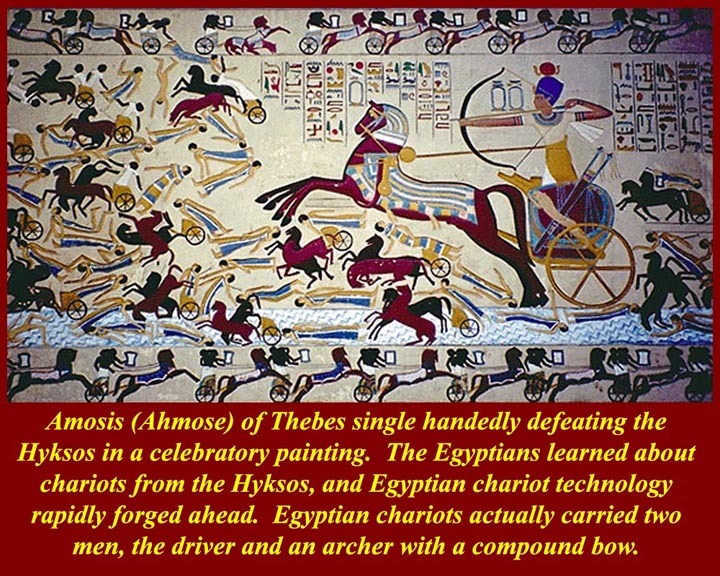 Ahmose I defeats the Hyksos single-handedly: in the manner of the pharaohs, he takes credit for everything. 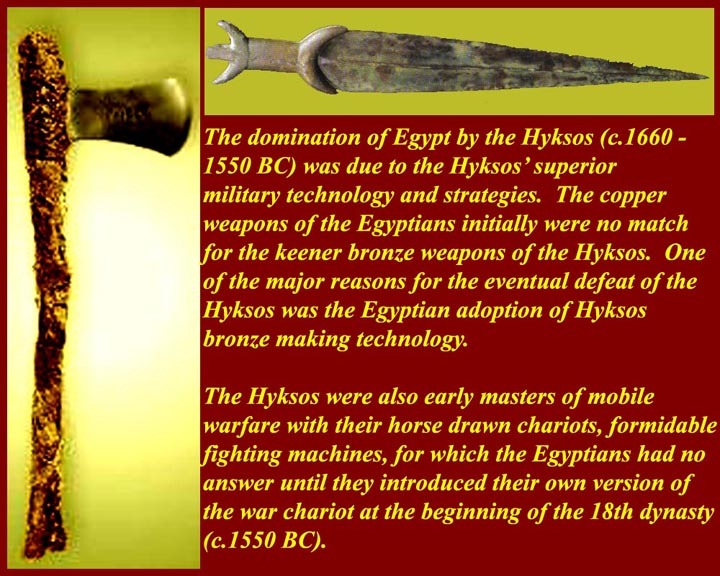 The weapons are actually Egyptian copies of Hyksos technology. Both weapons actually belonged, we are told, to Ahmose I. 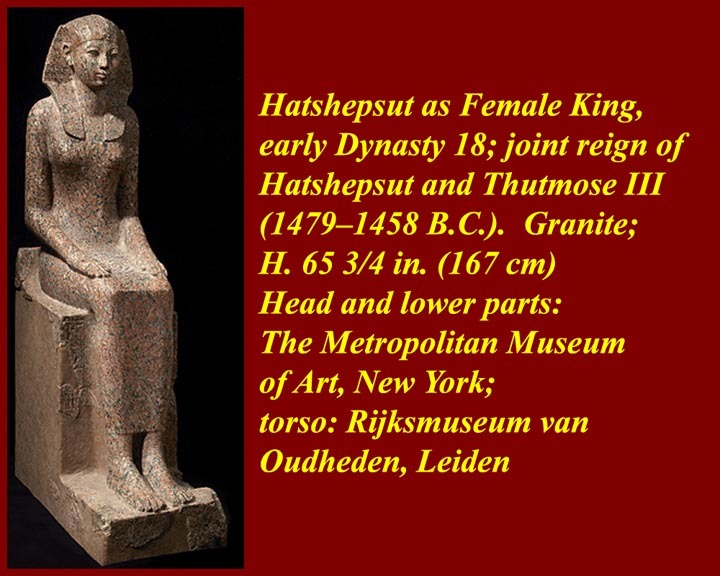 Despite the efforts of her successor/stepson, Thutmose III, many good images of Hatshepsut are available. Her story is also well known. Her reign was in the 18th Dynasty, c. 1473 - 1458. She had at least one daughter, but no son, and when her husband, Thutmose II, died, he named a son by a different wife as his heir. 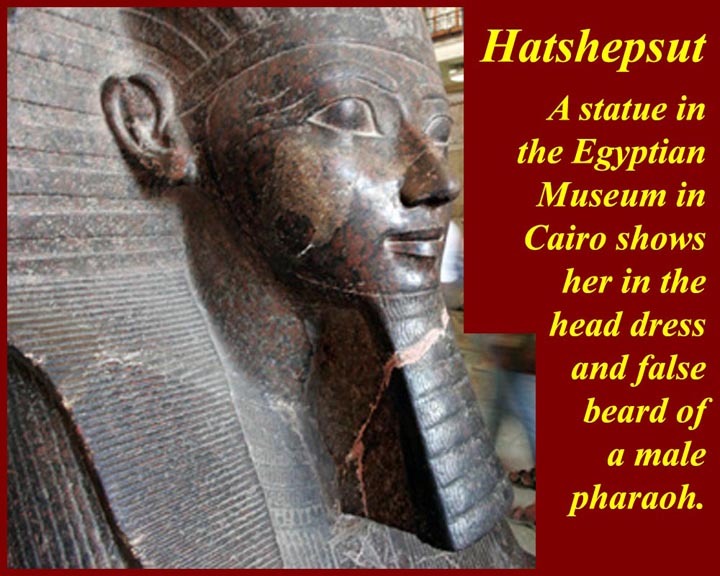 The heir was still a child, so Hatshepsut was named regent. She quickly usurped the throne and ruled on her own after having herself crowned as Pharaoh. She only gradually appears in the guise of a male pharaoh, adopting the regal kilt, the nemes headdress, and the false beard. 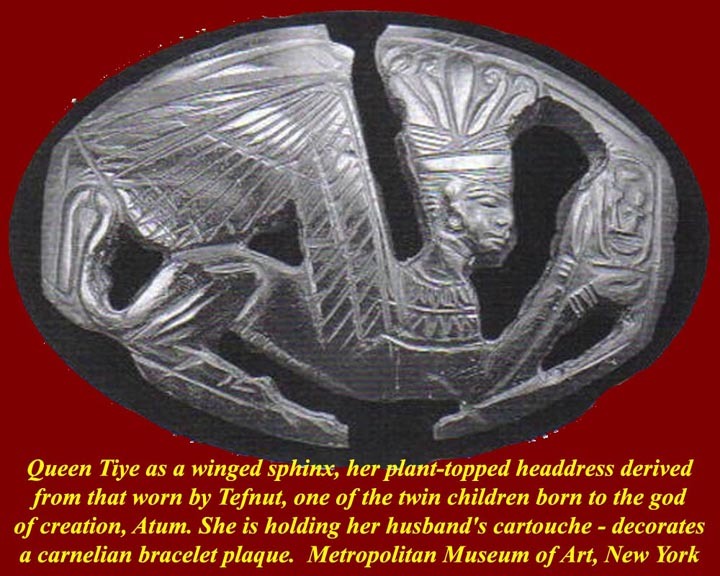 Eventually she dropped the feminine hieroglyph "t' symbol from the end of her name and ruled with the male name Hatshepsu. She wasn't the first female pharaoh, but, aside from Cleopatra VII (see below) she was certainly the most important. Her innovations set patterns that were followed throughout the New Kingdom period. Hers was the first (and deepest) tomb dug in the Valley of the Kings (KV 20), and she started it while her husband Thutmose II was still alive -- she was already a very powerful lady. It was originally designed to put her burial chamber directly below her Dayr al-Bahri temple, but the tunnel had to be diverted because of underground geological conditions. Her commercial expedition to Punt (perhaps Somalia?) set the pattern for future southern trading. 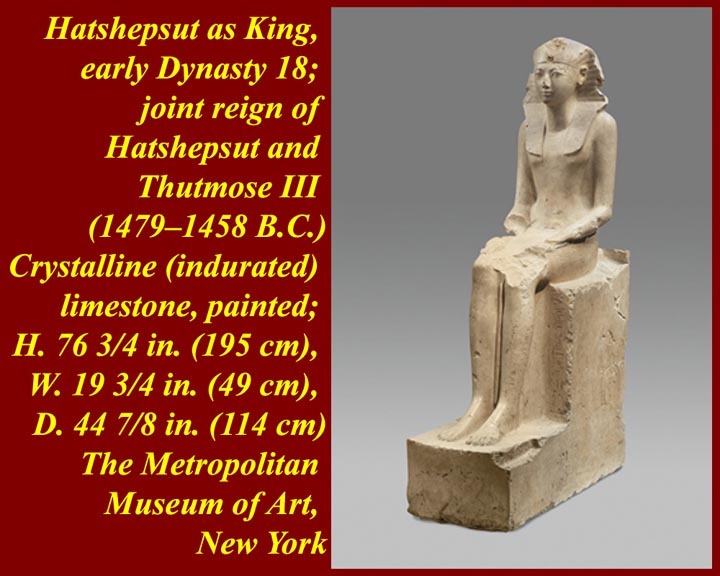 Thutmose III tried to obliterate her reign, but apparently not in anger: he did it many years after she died, perhaps when he realized his own mortality and wanted to ensure that his line and not the line of her father's family would retain the double crowns. 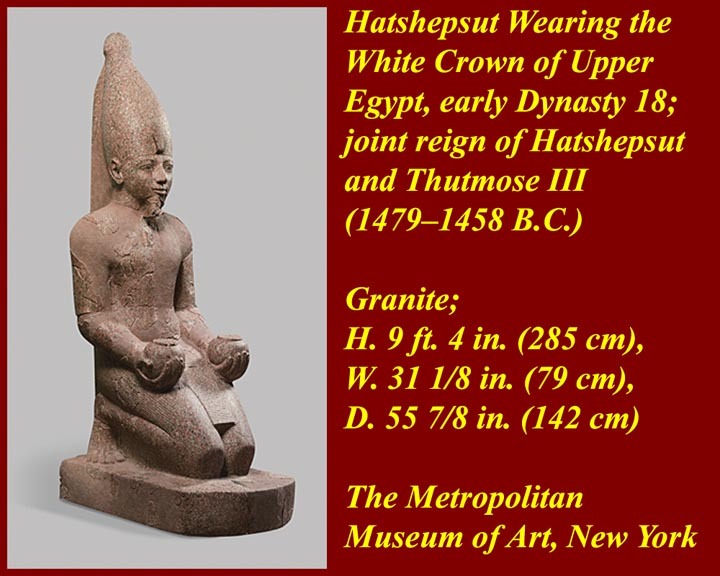 More Hatshepsut information is at http://www.crystalinks.com/egypthatshepsut.html, at http://en.wikipedia.org/wiki/Hatshepsut, and at http://touregypt.net/historicalessays/hatshepsut.htm. 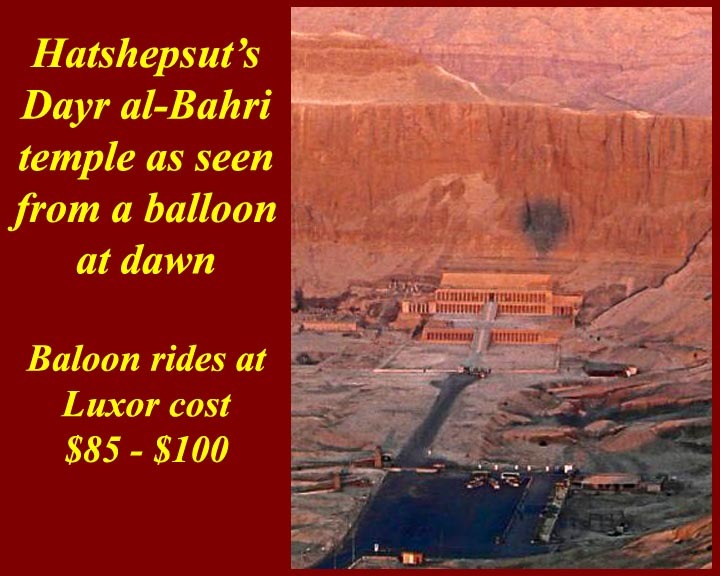 Hatshepsut's Valley Temple is at Dayr al-Bahri on the west side of the Nile opposite Luxor. The cliff behind the temple is an eroded ridge, immediately behind which is the Valley of the Kings and the entrance of he tomb. 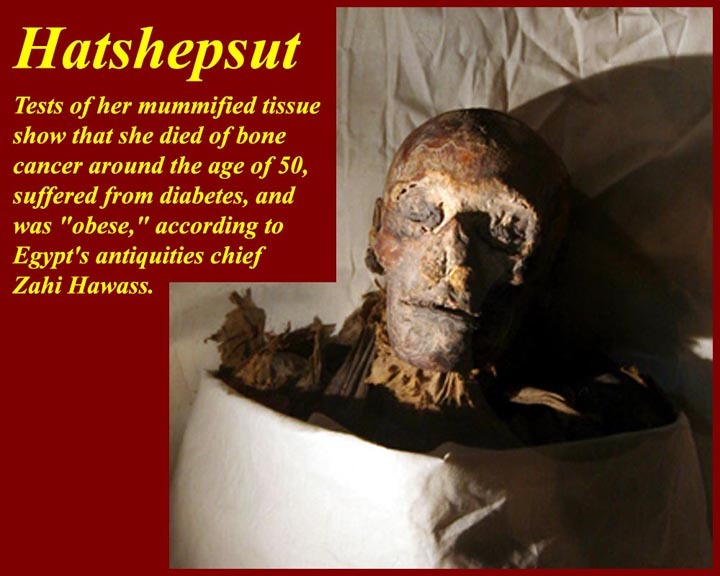 This mummy was identified as Hatshepsut in June of 2007 ending long years of speculation. The identification procedures included xrays, CT scans, and DNA matching with her known grandmother. 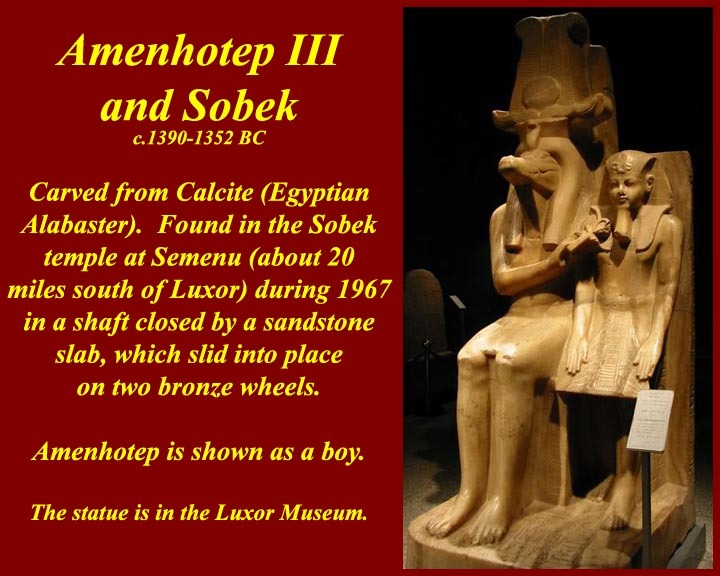 Amenhotep ruled from c. 1390 - 1352 BC. 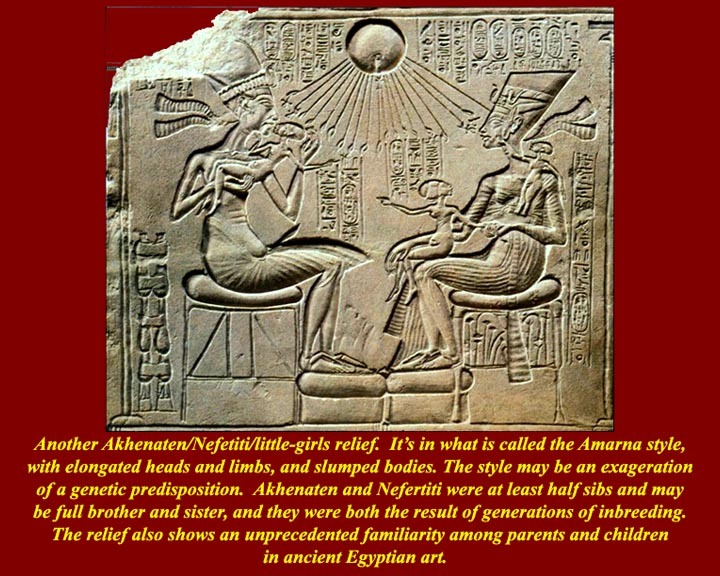 The main claim to fame of Amenhotep and his wife Tiy is that they produced the heretic Pharaoh Akhenaten. "Where did we go wrong?" they might ask. 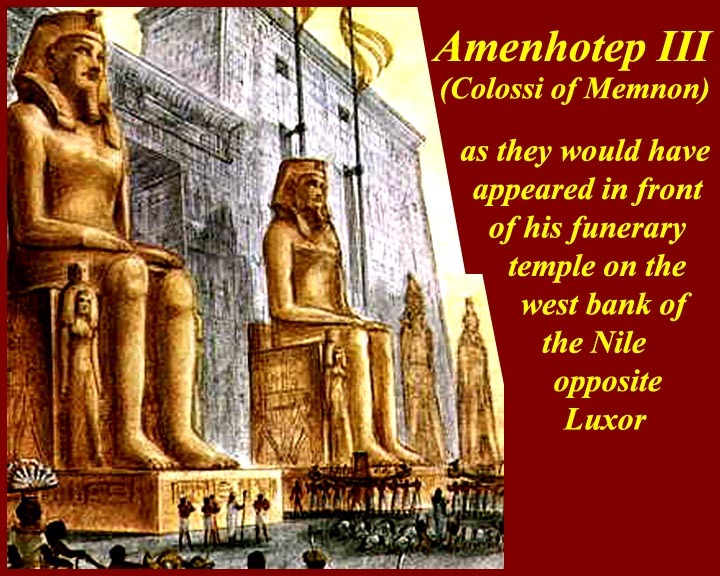 Actually, Amenhotep was, for centuries, much more well known than Memnon, or at least his colossal statues were. 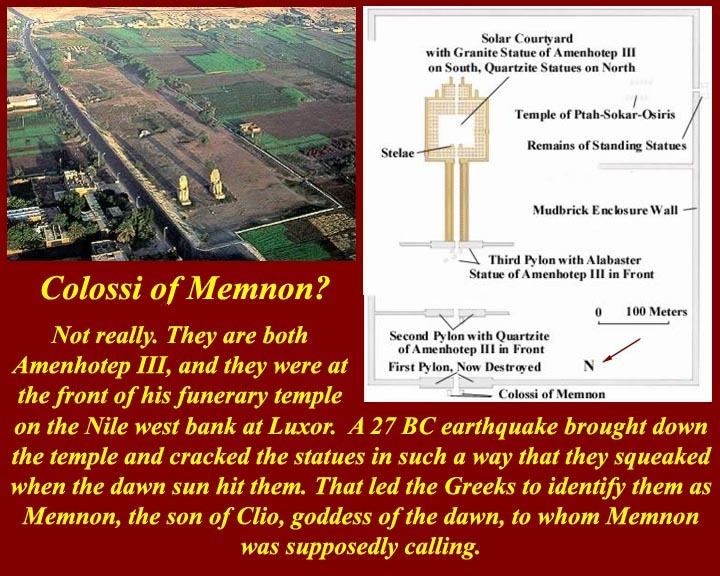 The colossal statues that stood in front of Amenhotep's Valley Temple (until the temple was brought down by a 27 BC earthquake, Nile flooding, and "stone mining") were misidentified by the ancient Greeks as the hero Memnon. Both statues were also badly damaged by the earthquake, and the one on the right (the northern one) "spoke" at dawn on sunny days: moisture and cool air that had accumulated overnight in the earthquake cracks wheezed out when the sun warmed the statue. The statue continued to sing out at dawn, and visitors came from miles around to hear the music, including Emperor Hadrian, in 130 A.D. The Roman emperor Septimius Severus, seeking to repair the statues in 199 AD, inadvertently silenced Memnon forever. 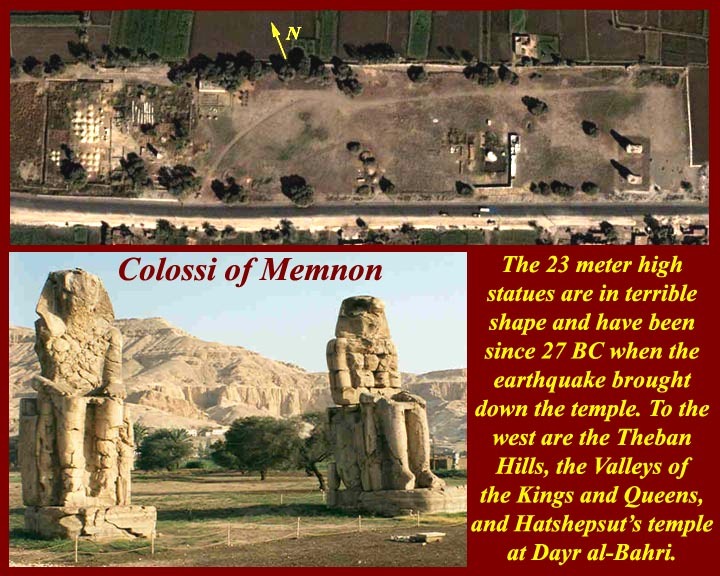 But the name stuck -- the statues are still called the Colossi of Memnon. Amenhotep's fame came when folks finally were able to read the inscriptions and identify him as the person seated in 64 foot tall grandeur. The two statues were each cut from a single block of white quartzite, making the two blocks the biggest ever quarried anywhere. More information is at http://www.bluffton.edu/~sullivanm/egypt/thebes/colossi/colossi.html, and at http://homepage.mac.com/cparada/GML/Memnon.html. In March of 2008, the Egyptian antiquities authority announced the discovery of a 12 foot statue of Queen Tiy, Amenhotep's wife, in excavations near the site of the colossi. (See: http://news.yahoo.com/s/afp/20080322/lf_afp/egyptarcheology_080322202539). 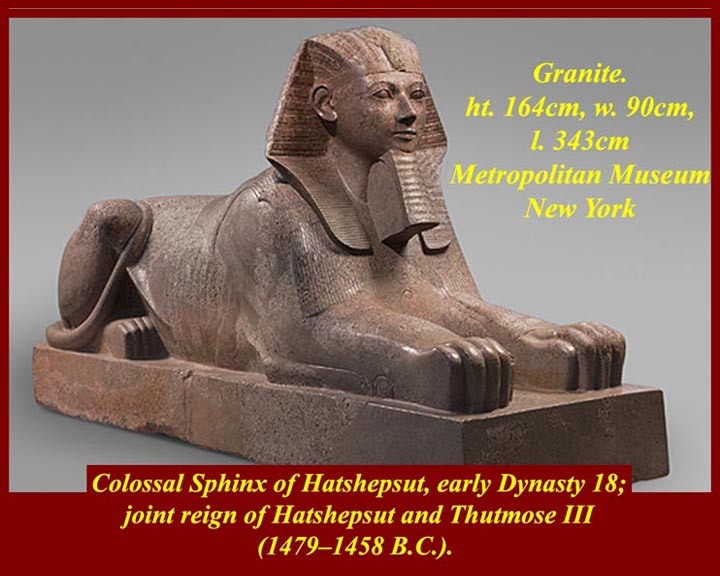 Two sphinxes representing Tiy and Amenhotep III as well as 10 statues in black granite of the lion-headed goddess Sekhmet, who protected the pharaohs, were also found by the archeologists. Two statues are 50 feet high, three-quarters the size of the colossi, were also found at the site in recent years. The authority hopes to display all the finds in an outdoor museum at the site within five years. 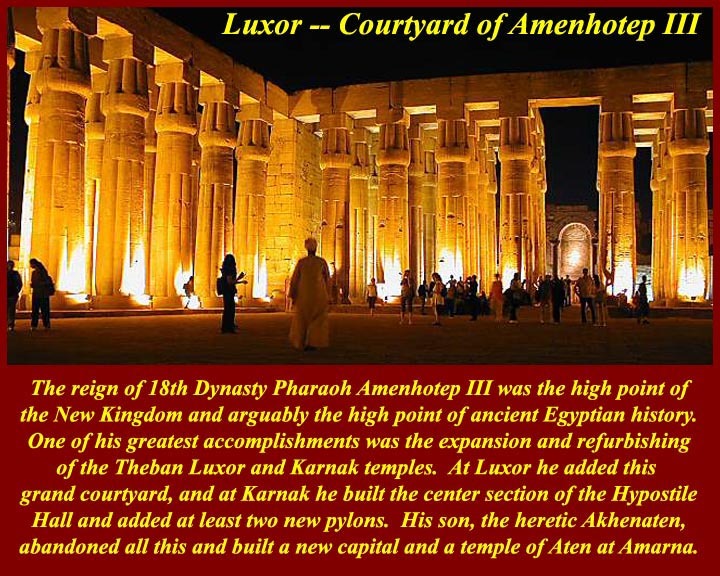 http://www.mmdtkw.org/EGtkw05038AmenhotepIIILuxor.jpgThe ability to read hieroglyphs and identify Amenhotep's colossi, also allowed acheologists to identify this famous courtyard at the Luxor temple complex as his. Almost all tours of Egypt include night visits to this temple. 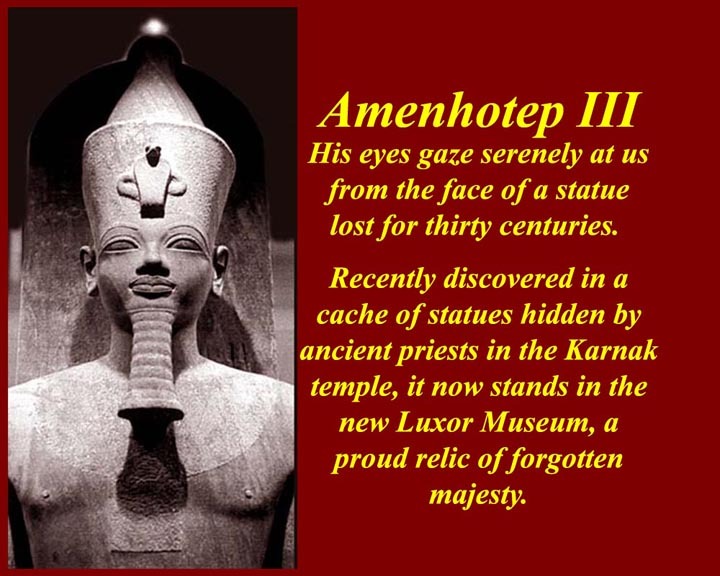 The statue of Amenhotep III was recently retrieved from a cache at Karnak. Priest would never think of destroying an image of a deceased sacred pharaoh, but they occasionally needed to make room in the temples for new images. Old images, even those in good condition like this one, were buried in sand pits in temple courtyards and then paved over. The same procedure was used to protect statues when enemies approached. Two images of Tiy(e), the wife of Amenhotep III and mother of Amenhotep IV, later known as Akhenaten, the Heretic Pharaoh. 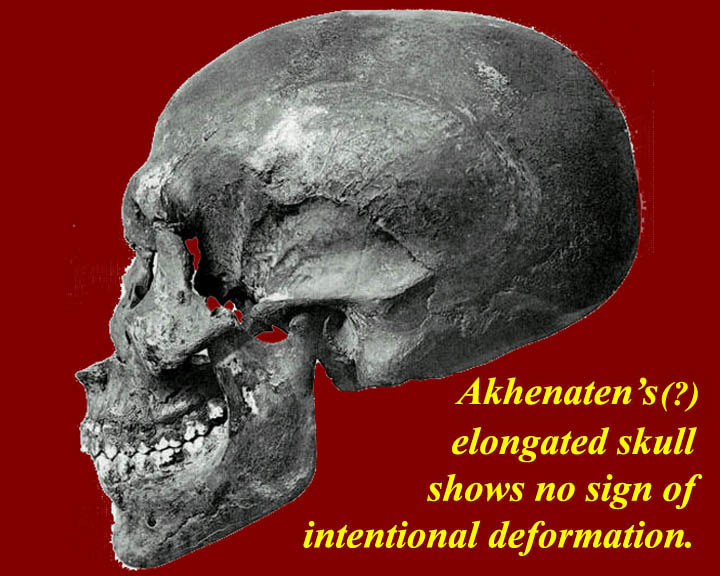 Scientists have always wondered whether Akhenaten, who ruled c. 1352 - 1336, had some kind of congenital defect that made him look like this. Some archeologists ascribe it all to an Amarna school of art. Others say the school of art was like the Haitian Merengue dance. The most popular Merengue story relates that Merengue, a great hero of the revolution who had been crippled in one leg, was welcomed home with a victory celebration. It was known that he loved to dance but all he could do now, was step with one leg and drag the other to close. Out of respect, everyone dancing copied him and the Merengue was born. The Merengue is still the national dance of Haiti. The analogous situation with the Amarna Style would be a deformed ruler whose deformity was copied in the style of art of his period. Akhenaten's skull exhibits structures that coincide with the "Amarna Style" images" the face is extremely long and narrow, the cheekbones protrude out to the side, and the upper teeth protrude accounting for these "Mick Jagger lips." 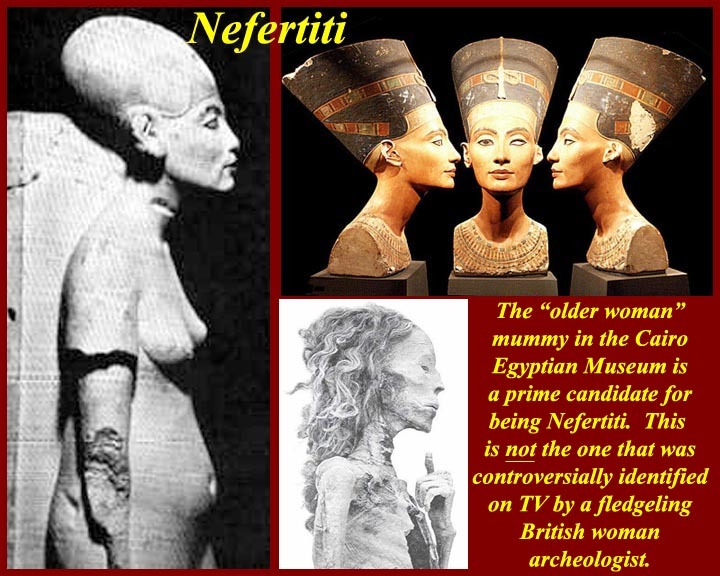 His wife Nefertiti, at least a half sib and maybe a full sister, exhibits similar trait, and, if we can believe the images, they passed them on to their daughters. 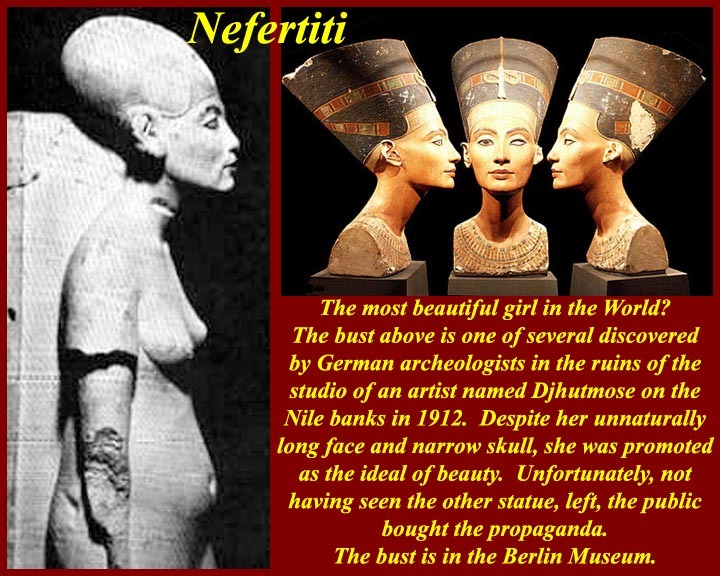 Nefertiti, long touted as the ideal of feminine beauty, doesn't look so hot when you get below her neck. 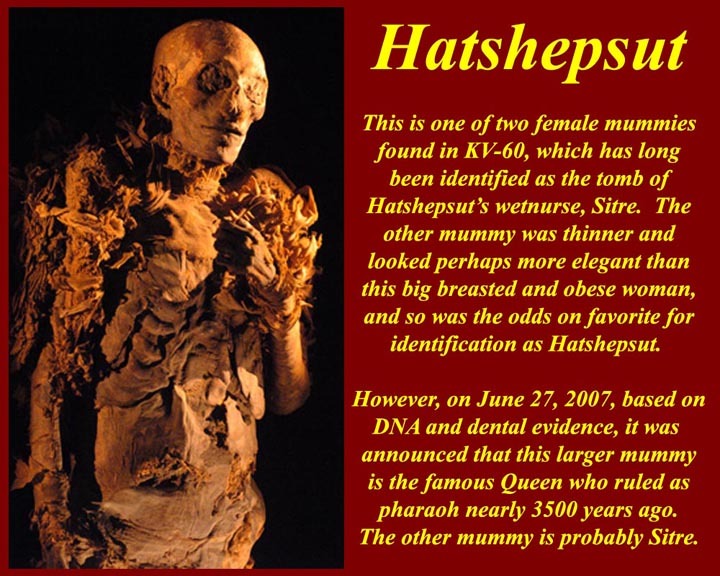 She's wearing a hat in the statues, but a mummy known as the "older woman" (meaning maybe 30 - 35), which may well be her (or one of her close relatives), shows the same facial structure as Akhenaten plus a very long neck like the necks in her images. In all her images she had a very narrow face, which also corresponds to the head of the mummy. Note that this is not the mummy recently identified by a newly minted British female archeologist on US and UK television. 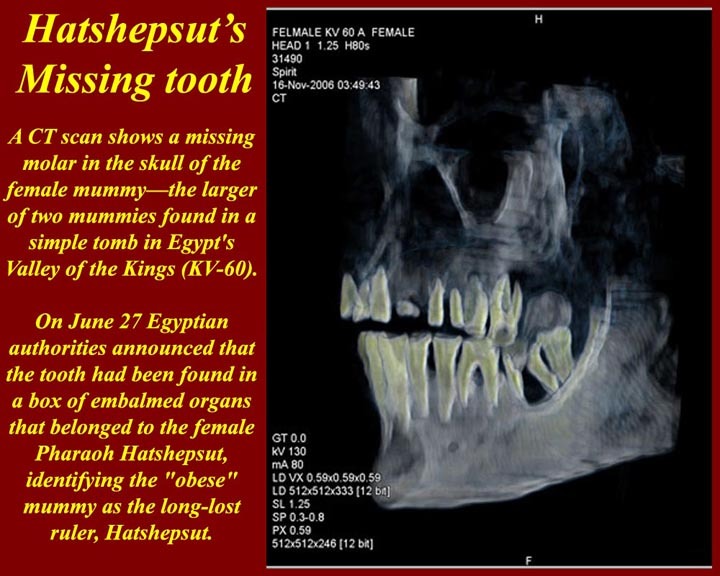 Her "findings" and "feelings" about the other mummy have been derided by almost all Egyptologists. 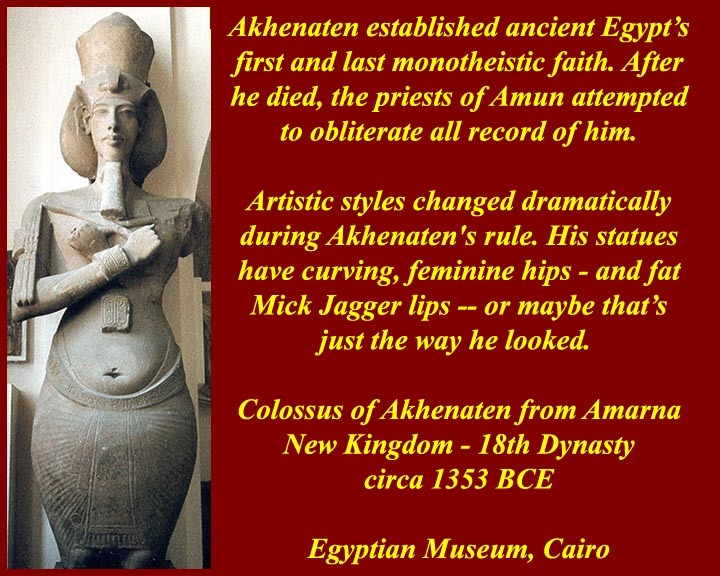 Western monotheists really want to believe that Akhenaten was a monotheist like them who was bent on eliminating pagan polytheism. They are not so friendly, however, to other ancient and modern solar worshipers. 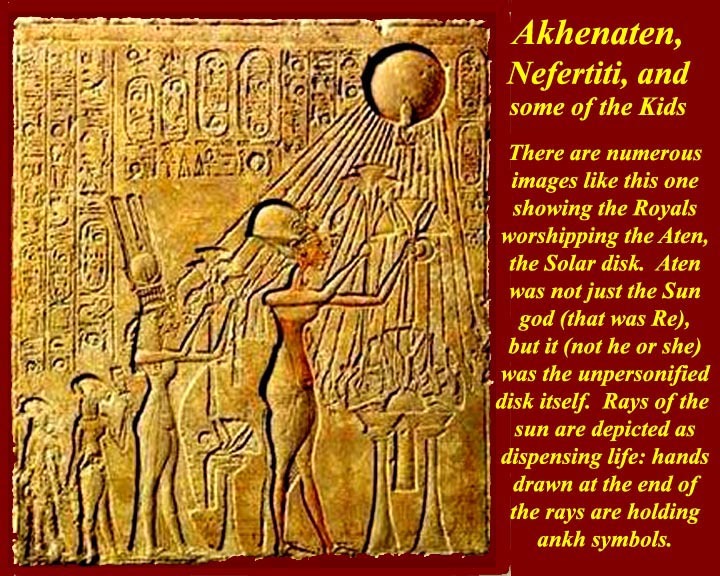 His worship of the solar disk does have some things in common with pre-Nicene Christianity when many Christians identified Christ with Apollo, the sun god, but that's a whole different adventure concerning gnosticism, or the "light of the world", etc. Maybe that can all be dealt with in a different course. 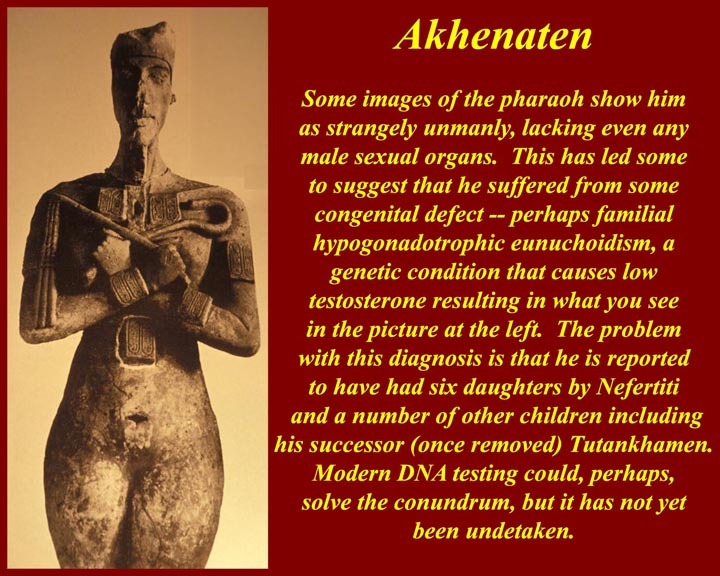 Akhenaten is remembered as a monotheist (who like most monotheists saw nothing wrong with persecuting everyone else), but his real contributions to ancient Egyptian history were two entirely different things: first, his heretical behavior provoked a backlash from which the monarchical power of the pharaohs never fully recovered. 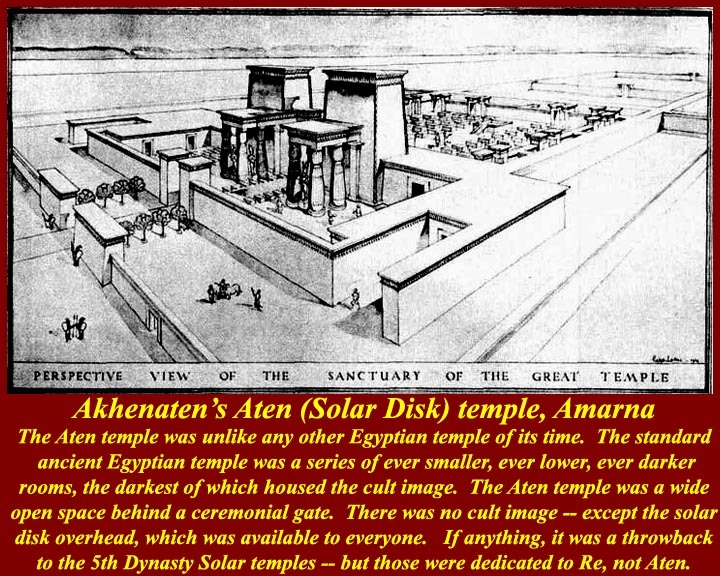 The priests and nobles who reversed Akhenaten's heresy always distrusted the monarch. It was a small step toward shared rule but nowhere near "democracy": it was at about the same level as the Magna Carta. 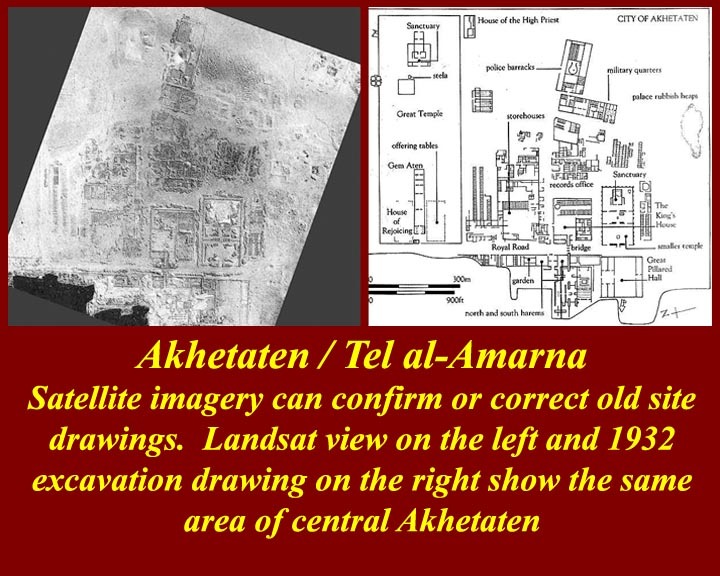 Second, and more important for the study of ancient Egypt, his new capital, Akhetaten (maps above, images below), is the place where we best can study how non-aristocratic Egyptians lived. 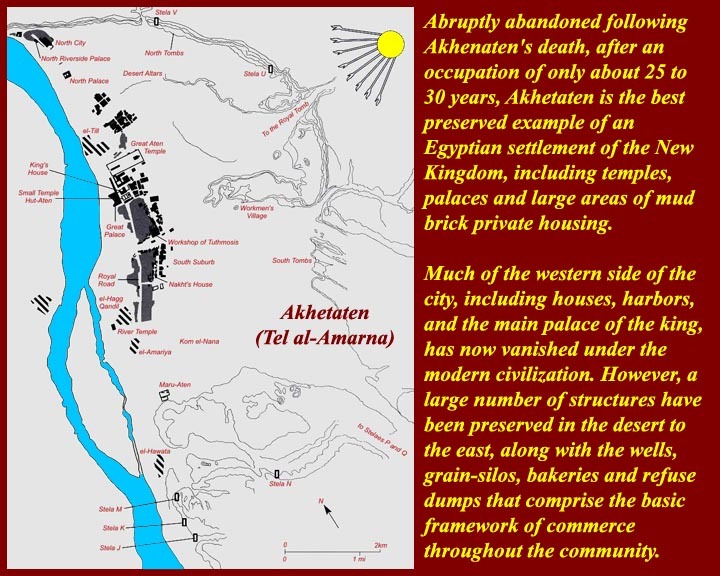 The reason for that is the simple fact that, when Akhenaten's heresy was repudiated, his city was also abandoned and was treated as if its site was cursed. 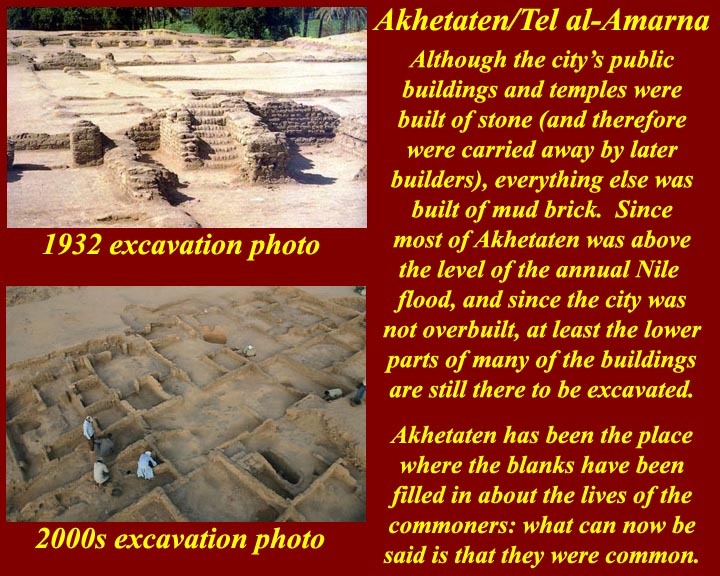 Nobody ever built another city on the site, and because most of the site is above the inundation level, the mud-brick neighborhoods of the city are still mostly there. 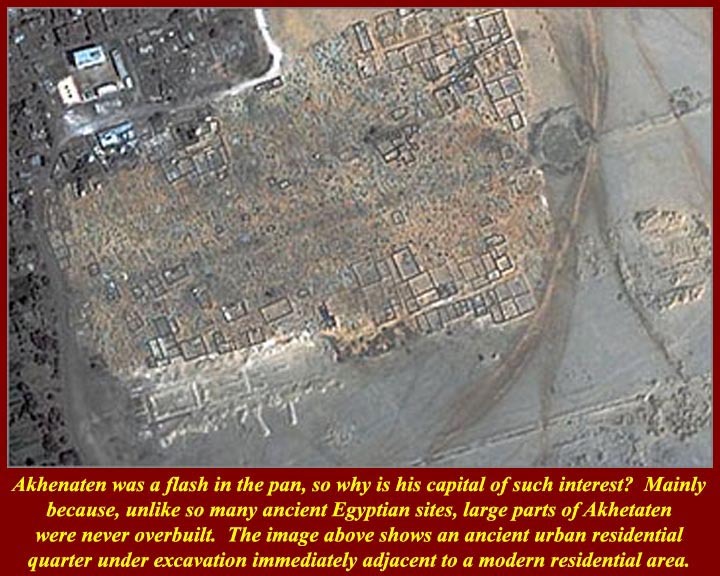 It is certainly the largest ancient habitation site in Egypt. 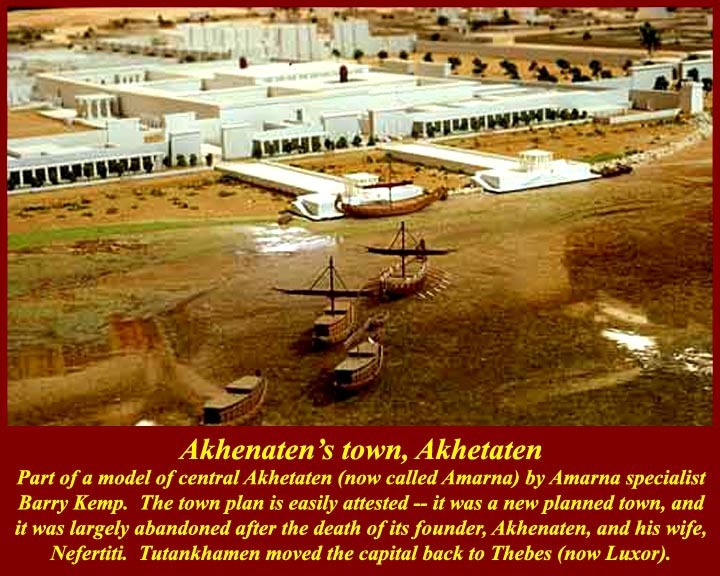 For information on the excavations at Akhetaten/Amarna, visit http://www.amarnaproject.com/. A satellite view of one of the residential neighborhood of Akhetaten. Model of the downtown riverfront. 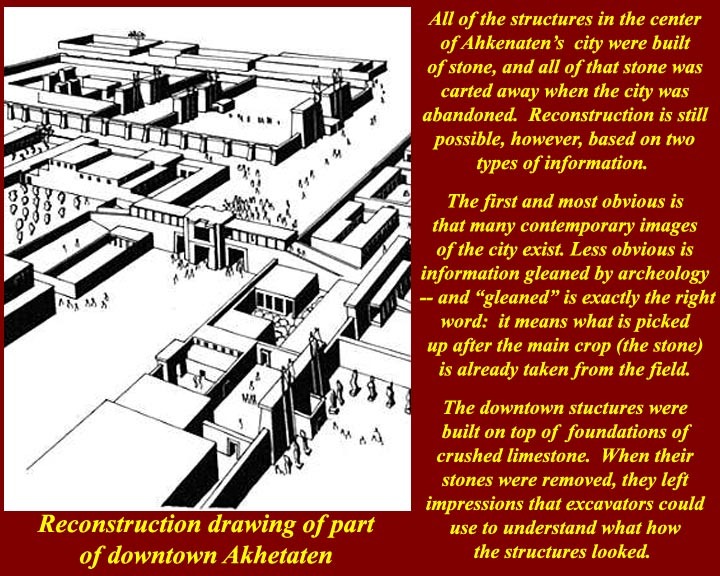 Drawing of downtown Akhetaten as reconstructed from impressions left by lower courses of stones on the crushed rock foundations. Reconstruction drawing of the Aten Temple from 1932 excavations. A recent satellite image beside a 1932 site drawing. Early and recent work among the mud bricks. 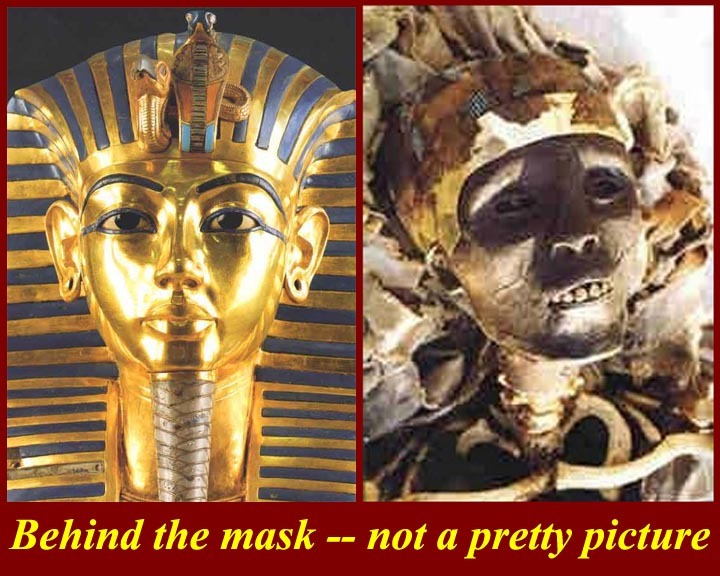 The Golden mask and what it hid -- note that he had the same kind of buck teeth that Akhenaten had. Tut, who ruled from 1336 through 1327, was not a particularly important pharaoh in his own time. 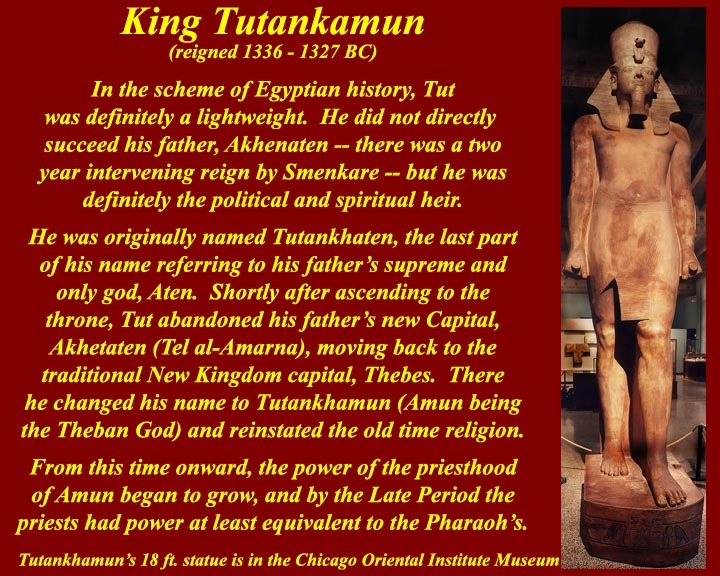 He quickly moved his court back to the normal 18th Dynasty capital, Thebes, and changed his name from Tutankaten to Tutankhamen, reflecting his abandonment of Aten and his adherence to Amun. Though not particularly important in his own time, Tut has been very important to Egyptology since 1922 when his un-plundered tomb was finally plundered. Tut enthusiasm is still helping Egyptologists worldwide to get their sponsorship and grants. 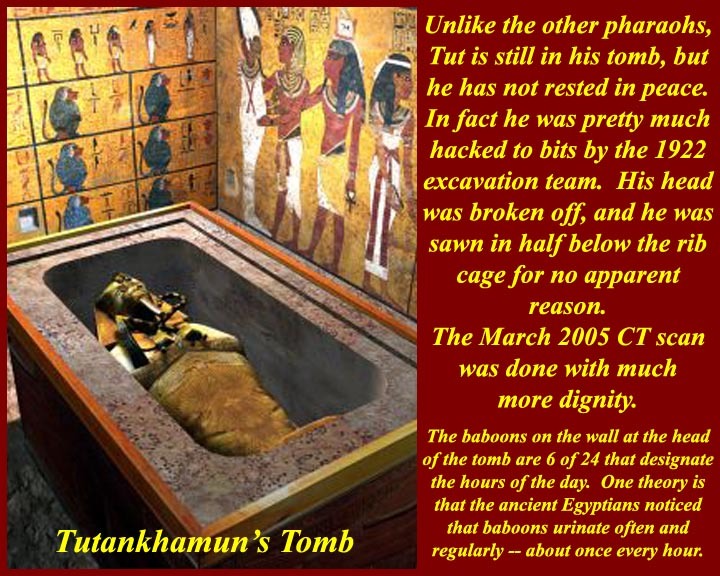 Tut himself was manhandled, stripped naked, his head was broken off, and he was cut in half, broken up, and reassembled, and that was all in the first few weeks after his body was found. His wealth, which he had managed to hold on to for thousands of years, was finally hauled off to museums and warehouses. He was, however, allowed to stay in his tomb to be visited by thousands of interesting tourists and a few interested tourists. 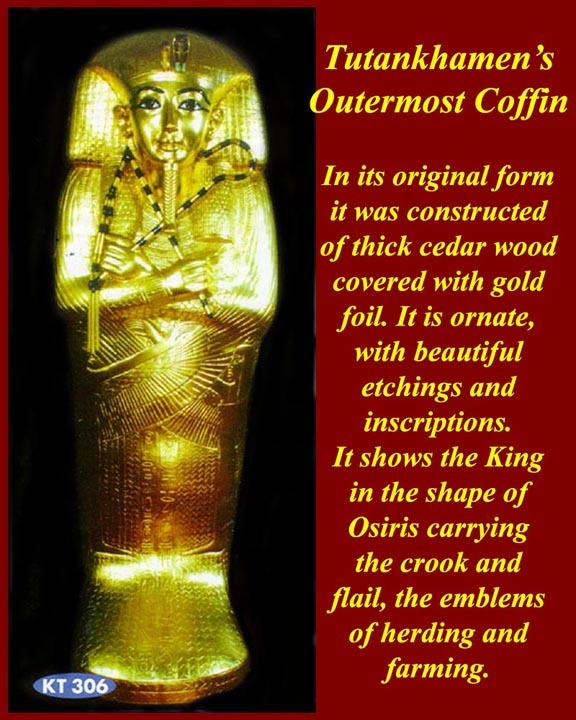 It has only recently been announced that as of November 2007, his mummy will be displayed in a climate controlled glass topped case in his tomb in the Valley of the Kings. 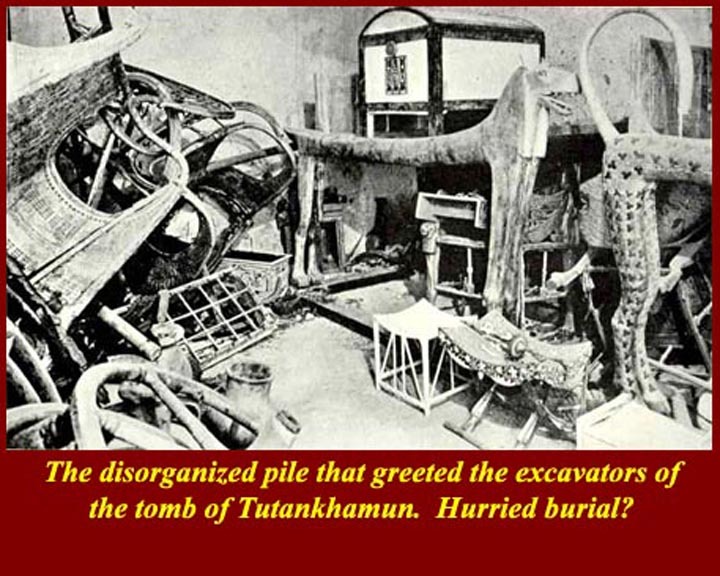 Two rooms of the tomb were piled full Tutankhamun's possessions, which, as you would expect, were kingly. The third and fourth room were the burial chamber and the room that held his canopic shrine. 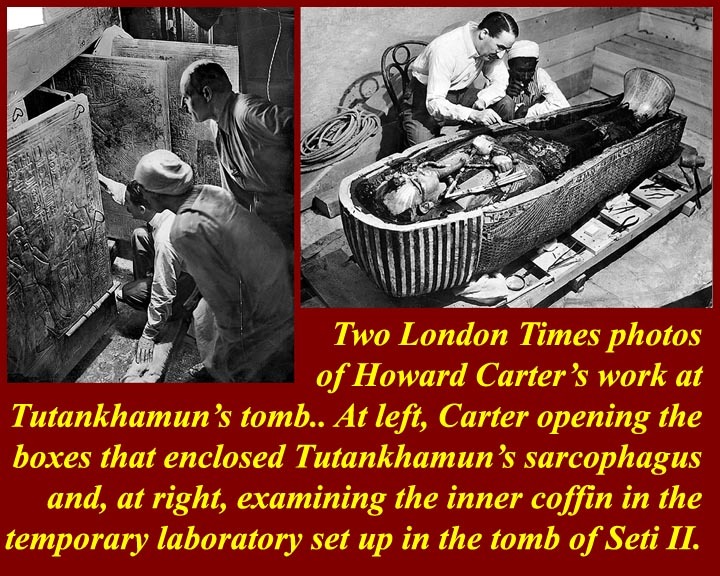 The second image shows Howard Carter opening the several ornamented boxes that held Tutankhamen and his several layers of coffins, the outermost of which is shown in the third image. 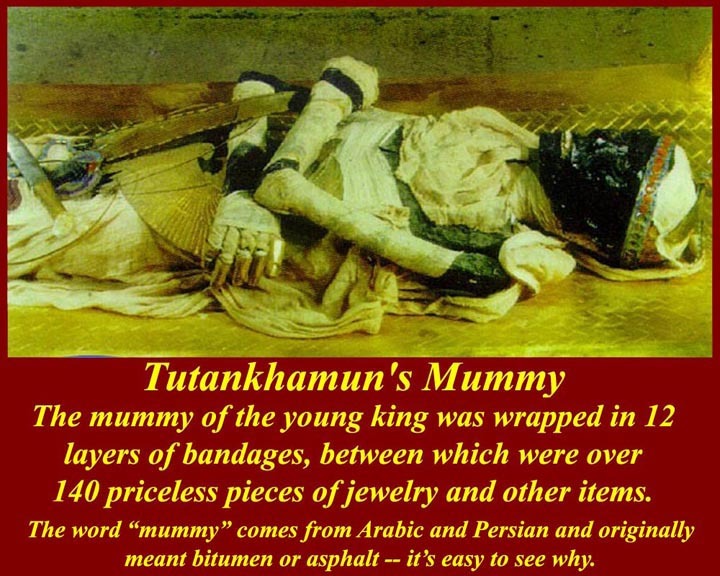 Tut's mummy is shown still stained with the resin which early Arab and Persian mummy salesmen had misidentified as mummiyya, their word for bitumen or asphalt. The blackened skin of Tutankhamun led to demonstrations in the US and the UK during the 2007 tour of some of Tut's treasures by blacks who wanted Tut to be proclaimed as a black African. 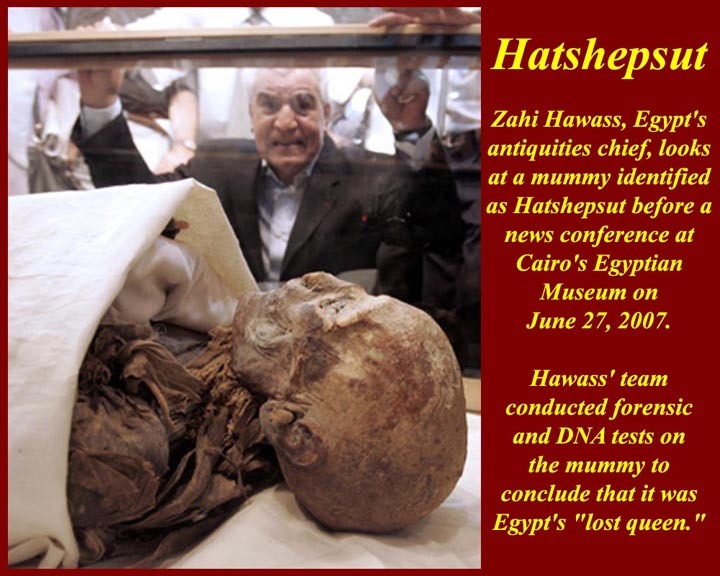 Instead, the demonstrations provoked a strong statement by Zahi Hawass that Tut, like all Egyptians, was not African at all, although he recognized that Egypt is in Africa. A March 2005 CT scan ruled out foul play in Tutankhamen's early death: a leg, probably broken shortly before his death, was the only injury noted, and the examination team speculated that Tut may have died of a infection associated with the injury. Conspiracy advocates had long theorized that Tut was killed by a blow to the head: bone fragments had been seen in the skull in earlier xrays. (They even had a prime suspect for the "murder", Tut's successor, Ay.) But these more recent tests showed no skull damage and said the bone fragments were a normal part of removal of the brain through the nose. 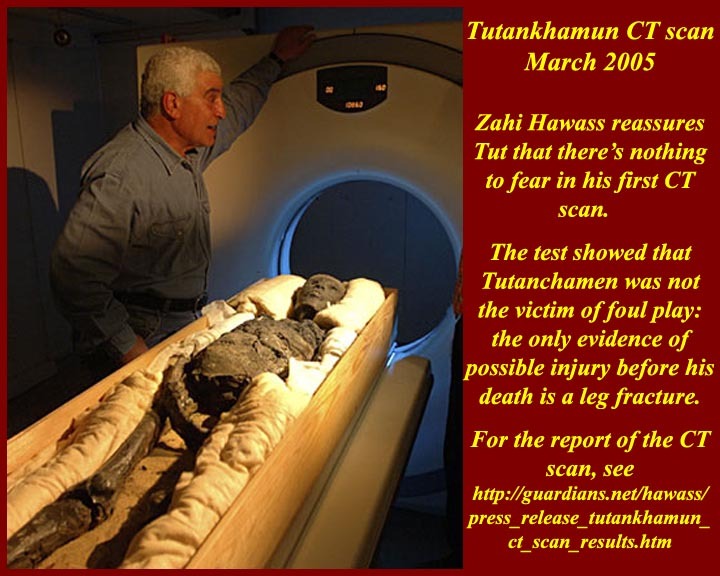 For information on the CT scan and other tests, see http://guardians.net/hawass/press_release_tutankhamun_ct_scan_results.htm. 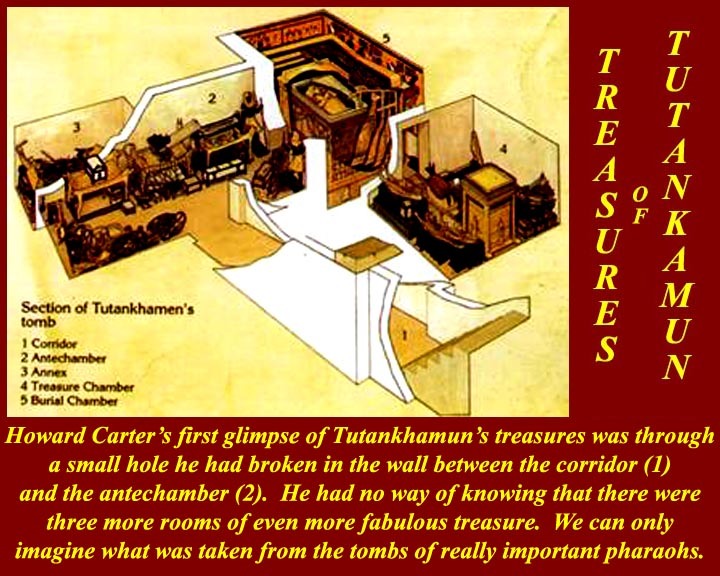 The two rooms which contained Tut's jumbled furniture and furnishings were not decorated, but the burial chamber, which now holds only the Stone sarcophagus and the inner coffin holding Tut's body is beautifully painted, as is the canopic shrine room. 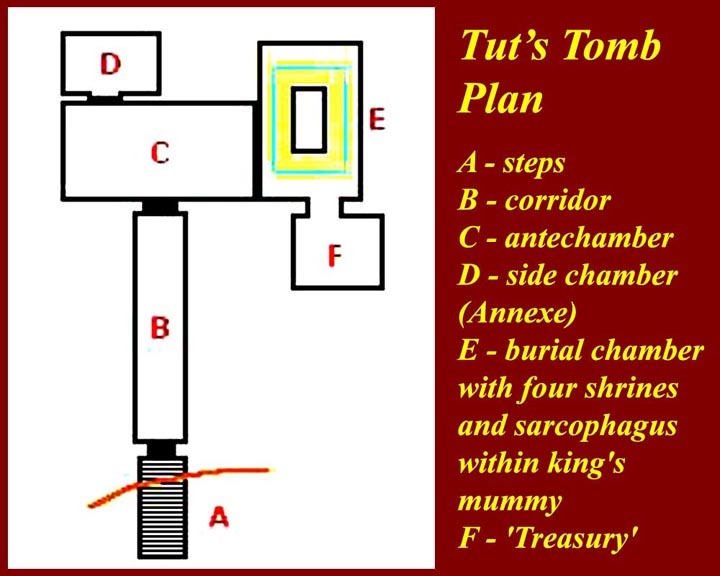 There is a theory that the jumble in rooms c and d of the tomb was caused by early tomb robbers who may have been surprised and fled with little or no loot. Many archeologists believe, however that it was the result of hurried burial practices and that this may also have been the case in other tombs, the contents of which were carried away -- so we're not likely ever to know. All the contents of the rooms and all of their decorations are available at links shown in the sixth image. You will have noted the strange and probably painful positions assumed by the human subjects of Egyptian Art. There is also no real perspective, nor is there any size consistency. As in Medieval European art, important people tend to be bigger than others. There are stock poses that help to identify the situation portrayed. 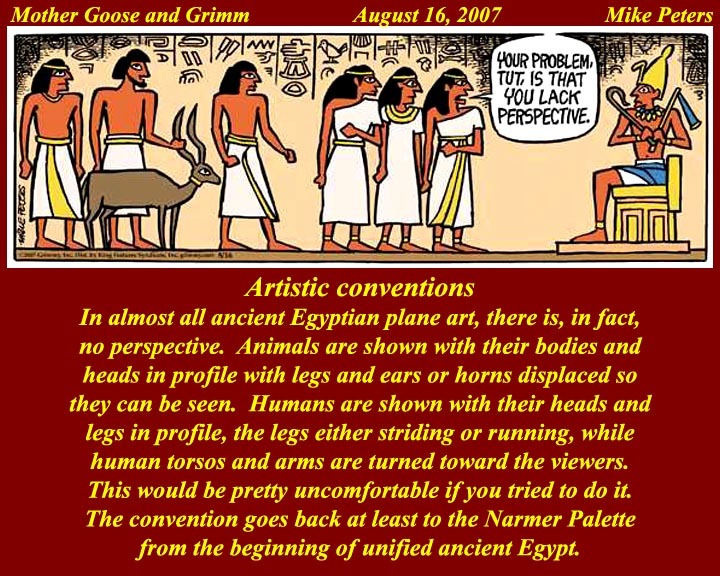 One of the things that would have shocked ancient viewers of Amarna Art was the loosening of situational poses. 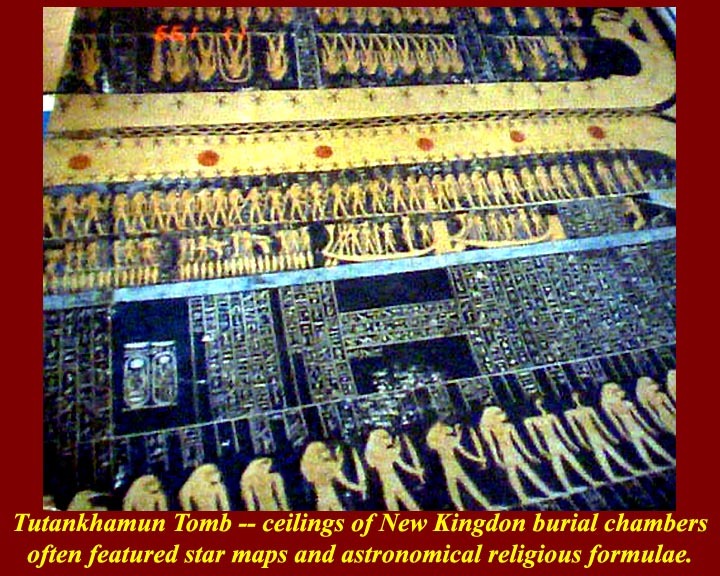 It was all ratcheted down again when Tutankhamen moved the capital back to Thebes, where, it is assumed, he came under the strong influence of the priests and the more conservative members of the nobility who had continued to reside in Thebes during the Amarna period..
Star charts were common on royal and noble tombs. They were there to mark the hours (stages) of the passage of the deceased through the darkness to the afterlife and by analogy the deathlike passage of the world through nightly darkness. Formulae to ease the passage were included in hieroglyphic panels. 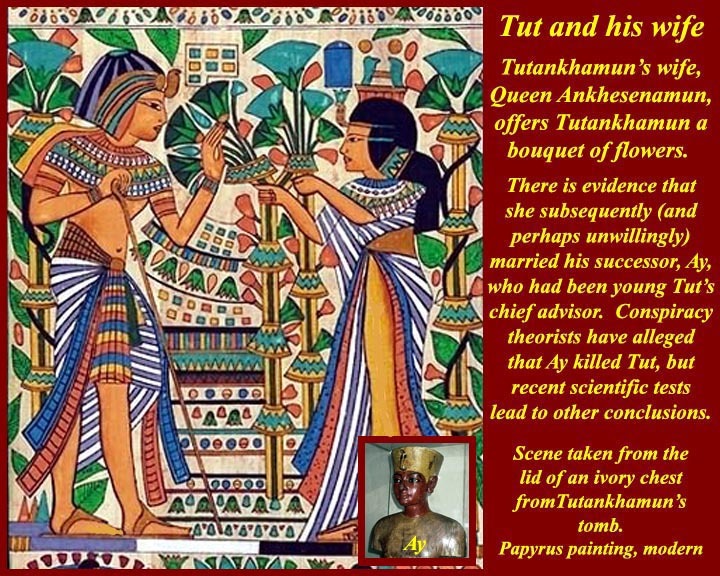 Tutankhamun and his wife, who, after his death, married his successor Ay, perhaps against her will. 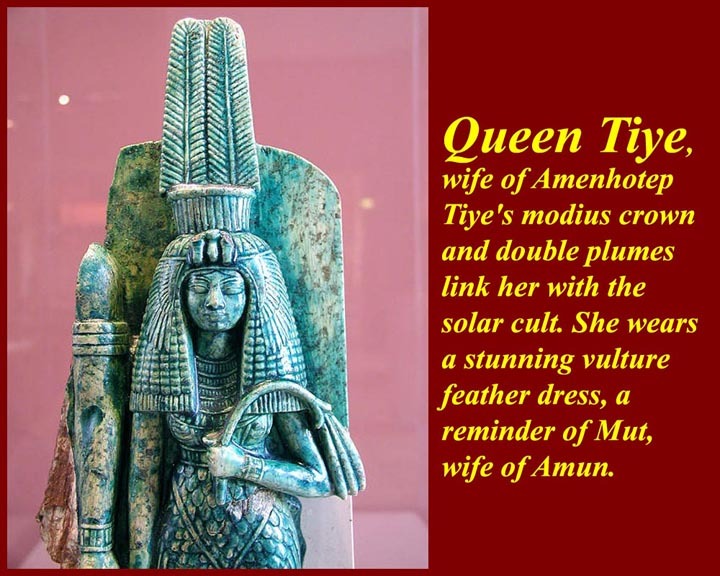 Ay was Tut's chief adviser and a member of a commoner family that also may have produced produced Tiy, the wife of Amenhotep III and mother of Akhenaten. 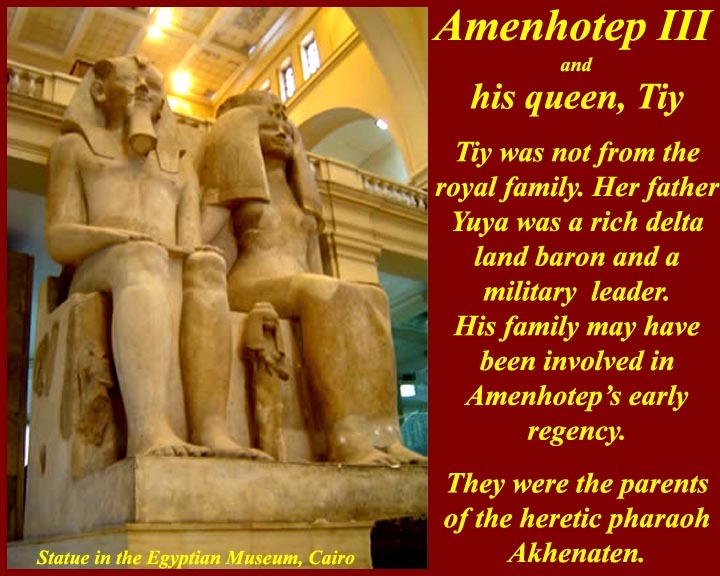 Ay married Ankhesenamun to prop up his legitimacy as Pharaoh. The successors of Tutankhamun destroyed most of his monumental works during their campaign to invalidate the rule of Tut's father Akhenaten. Two statues, one each of Tut and his wife in the Karnak temple complex, escaped the general iconoclasm. They portrayed Tut as Amun-Ra and his wife as Amunet, the feminine aspect of Amun, images that the priesthood of Amun would want to protect. The suspicions of Ay and of Ay's successor, Horemeb, that Tut was insincere in his conversion back to Amun may have been justified. 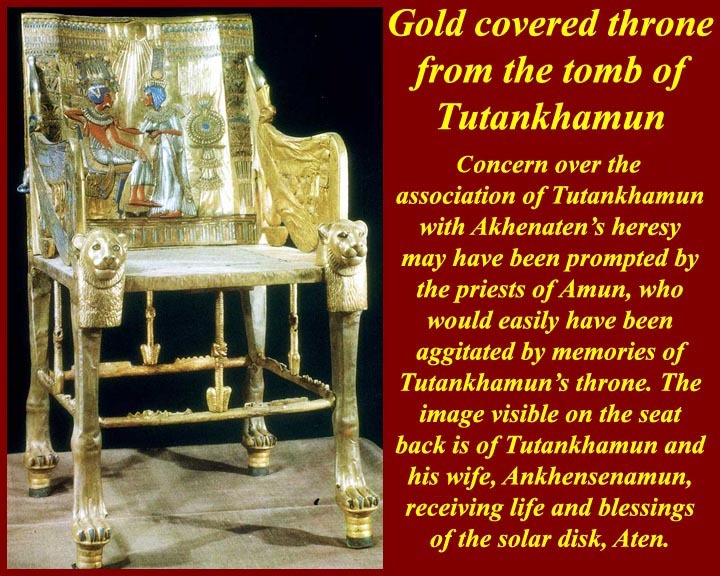 This gold encased throne found in Tut's tomb shows him and his wife receiving the blessings of his father's god, Aten. The first image shows a statue of Tutankhamen (17 ft. 4 in.) in the newly renovated Egyptian Gallery at the Oriental Institute Museum at the University of Chicago. The base is inscribed with the name of Horemheb who had usurped the statue and erased the name of Ay who had usurped it from Tutankhamun. 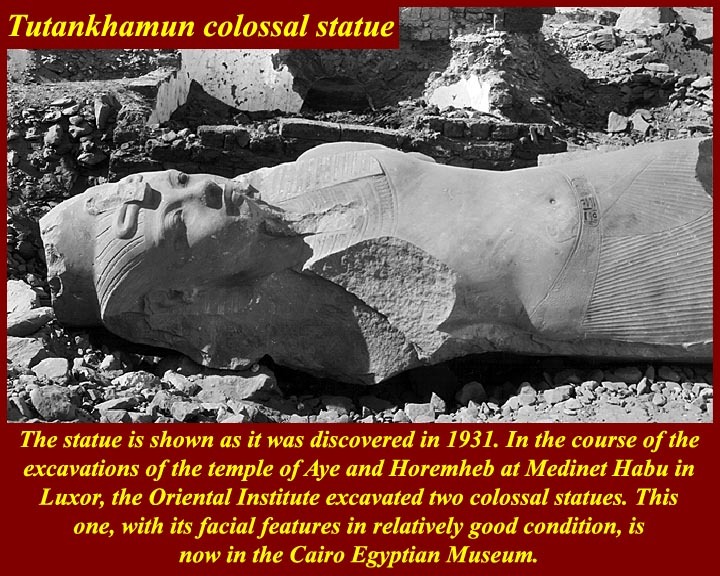 The fragmented duplicate of the first statue is shown where both were was found in 1930 in Medinat Habu, across the Nile from Luxor. The second statue, which has less damaged facial features, is now in the Cairo Egyptian Museum. The internet site of the Oriental Institute is at http://oi.uchicago.edu/, and Cairo Egyptian Museum site is at http://www.egyptianmuseum.gov.eg/. The entrance of the tomb of Tutankhamen in the Valley of the Kings is seldom seen without its long line of waiting tourists. You have to decide whether to join the line as you pass the ticket kiosk at the entrance to the valley -- a separate ticket is required. 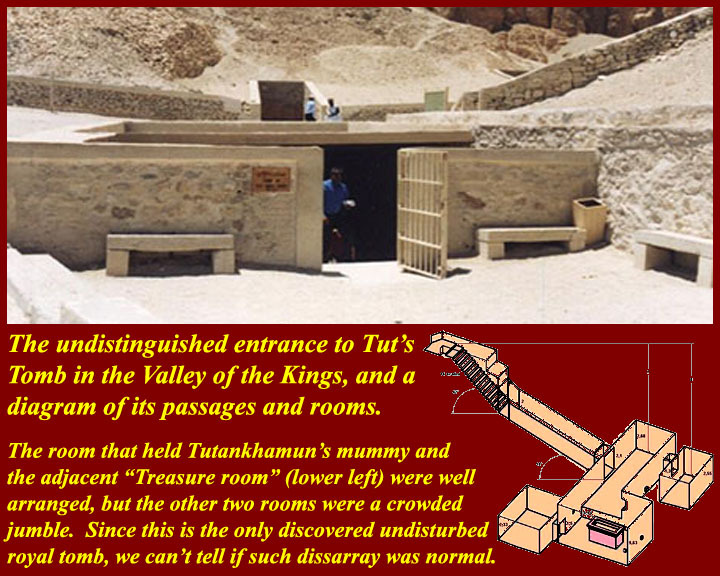 There is, in fact, nothing in this tomb (except Tut) that you can't see in other Valley tombs, for which you buy a single ticket to visit three tombs (or two tickets for 6, etc.) Your guide can help you decide which tombs to see. The artifacts taken from the tomb fill a hall in the Cairo Egyptian Museum, where there is also a line to get into the small room where the golden mask is kept. 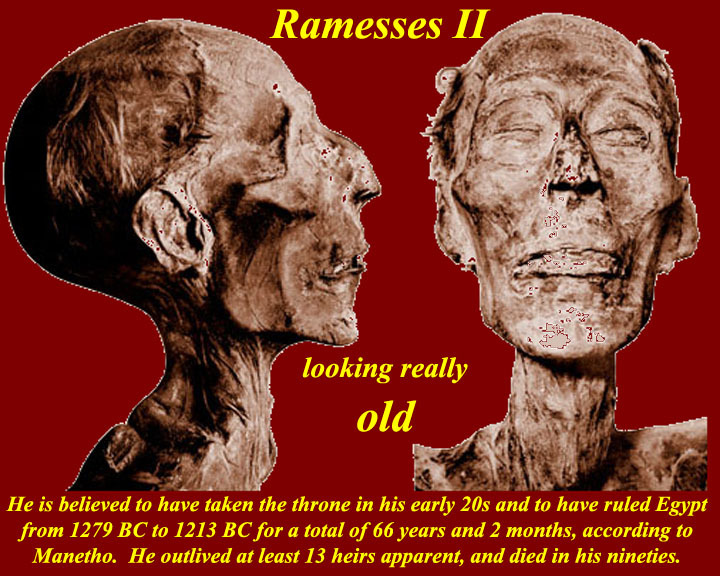 Ramesses II "the Great" ruled from c. 1279 to 1213 BC, a very long reign. 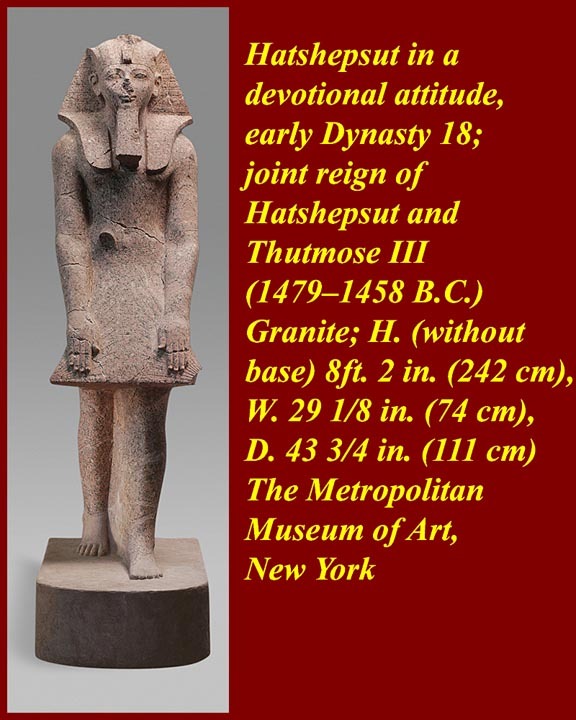 He was the third pharaoh on the 19th Dynasty. By the time we get to him the New Kingdom is well past its prime (which it probably reached with Amenhotep III of the previous dynasty). 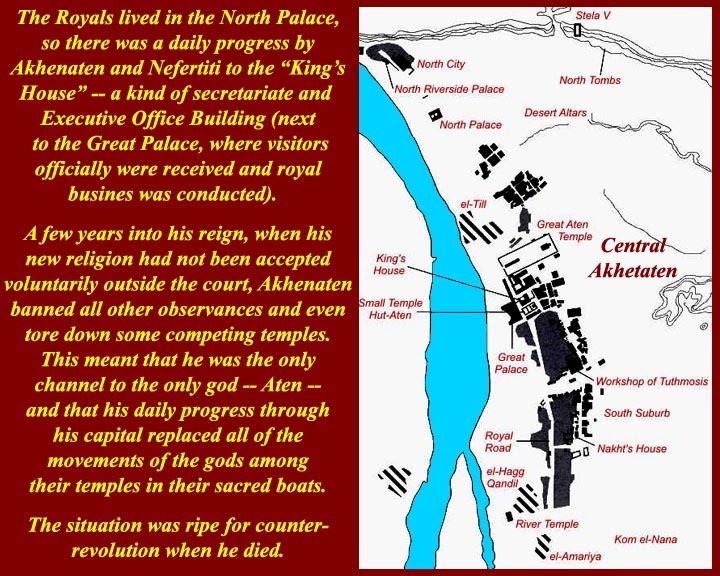 His 66-year rule gave him ample time to set up a really good public relations office and to build new temples and embellish old ones with tales of his questionable military exploits. In his monuments, he appears to have striven for big rather than elegant. 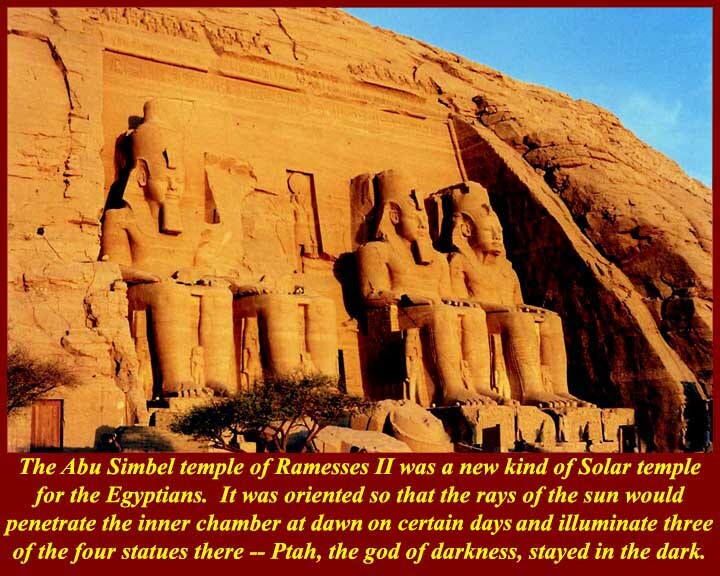 Belzoni also excavated the Abu Simbel temple of Ramesses II. 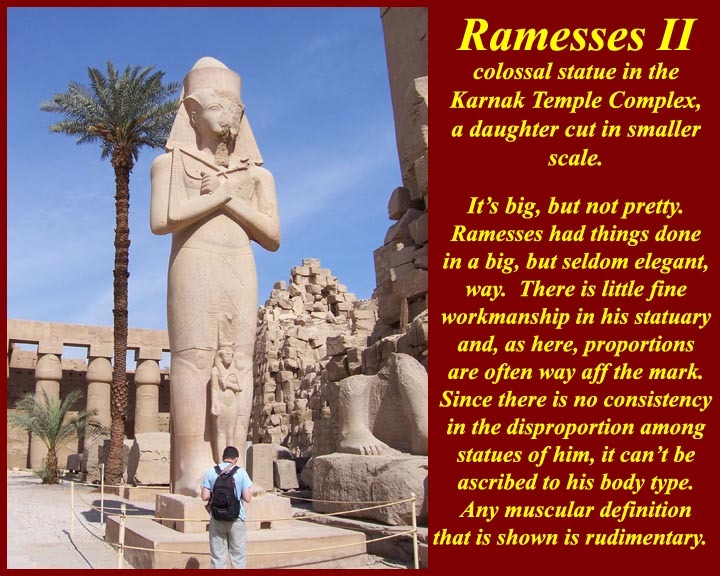 Ramesses had built it as a monument to himself (there's also a half-size temple of his wife, Nefertari) and as a showpiece to overawe the Nubians. It is really big and really inelegant. The four colossi are misproportioned and their musculature is only schematically done. 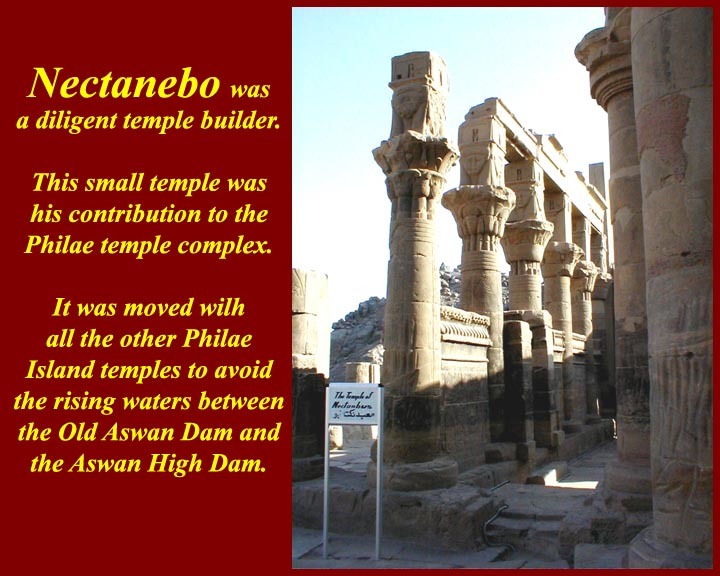 The most interesting thing about the temple is that it was moved to its present location to save it from the rising waters of Lake Nasser behind the Aswan High Dam. 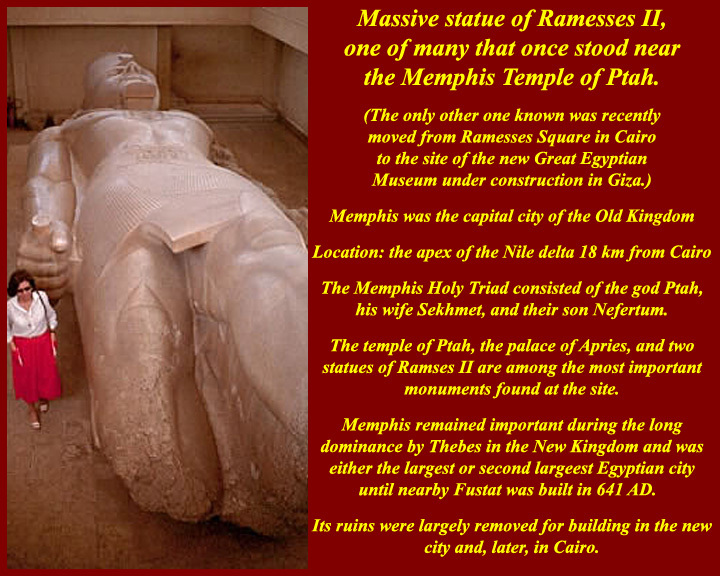 The fallen colossal statue of Ramesses II at the Ptah Temple in Memphis, like those at Abu Simbel, is huge but lakes fine detail. New Kingdom valley temples along the west side of the Nile opposite Luxor. Many of those built in the area closer to the Nile (lightest color on the map) have been seriously damaged by occasional higher than normal inundations. "Occasional" over a period of more than 3000 years can add up. 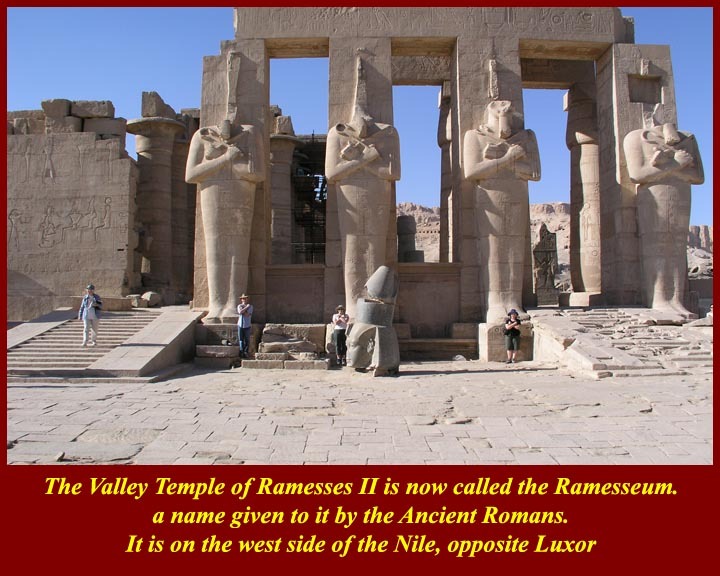 Information on the Ramesseum is available at http://www.archeo.ens.fr/8546-5Gren/clrweb/7dguylecuyot/GLRamesseumWeb.html. Ozymandias represents a shaky transliteration into ancient Greek of a part of Ramesses' throne name, User-maat-re Setep-en-re. The sonnet paraphrases the inscription on the base of the statue, given by Diodorus Siculus (90 - 20 BC) as "King of Kings am I, Osymandias. If anyone would know how great I am and where I lie, let him surpass one of my works." 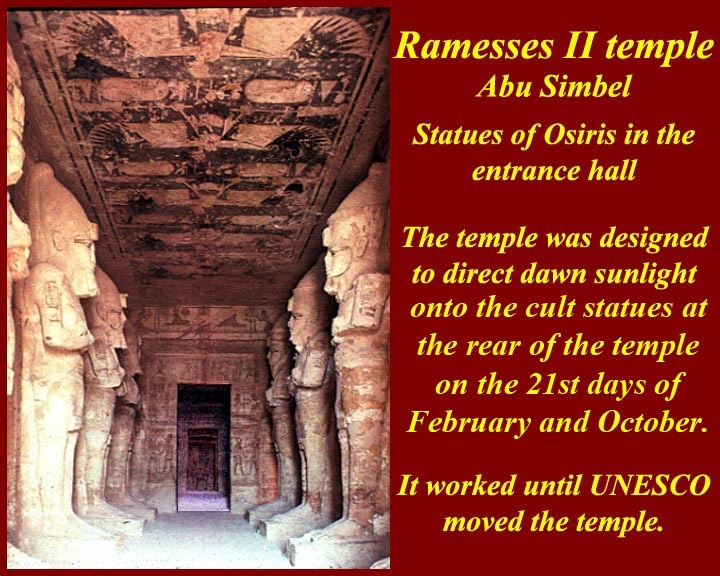 Ramesses tomb was desecrated. His mummy was retrieved from his tomb by worried priests of Amun and stashed with many others in the Dayr al-Bahri Mummy cache. 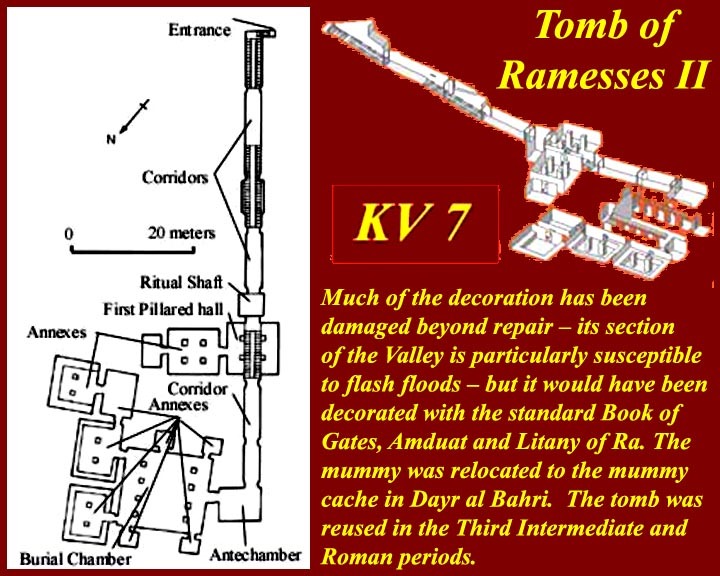 For information about tomb robberies during the New Kingdom and how the royal mummies were retrieved and hidden see http://www.thebanmappingproject.com/articles/article_2.6.html. 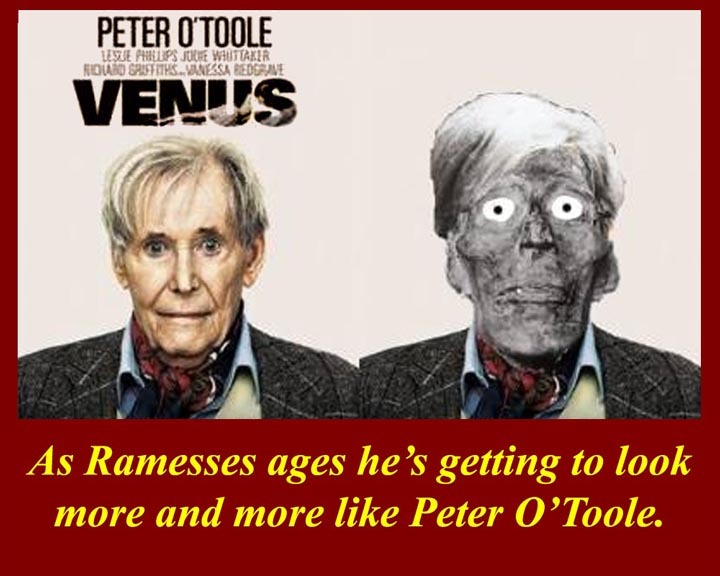 Ramesses has appeared in many movies. Although the tomb of Ramesses was wrecked by floods, the heavily restored tomb of his wife, Nefertari's looks quite well. 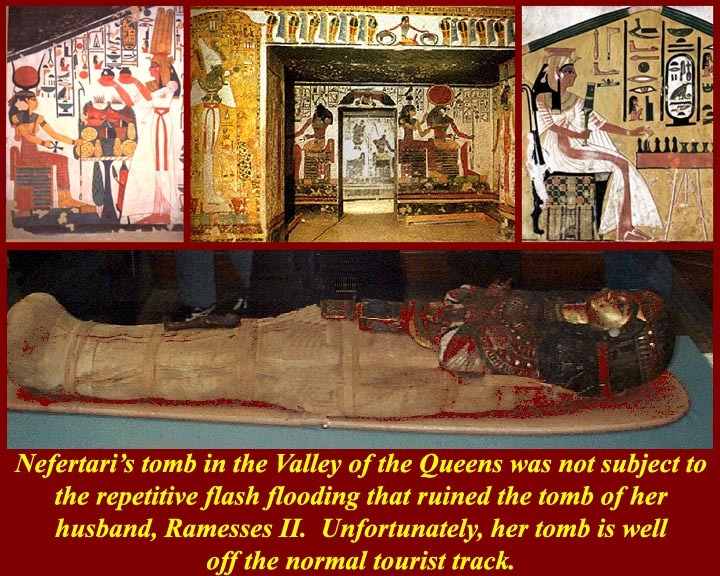 For a fine Internet essay on her tomb, the best in the Theban Hills, go to http://www.swarthmore.edu/Humanities/pschmid1/essays/Nefertari/nefertari.html. 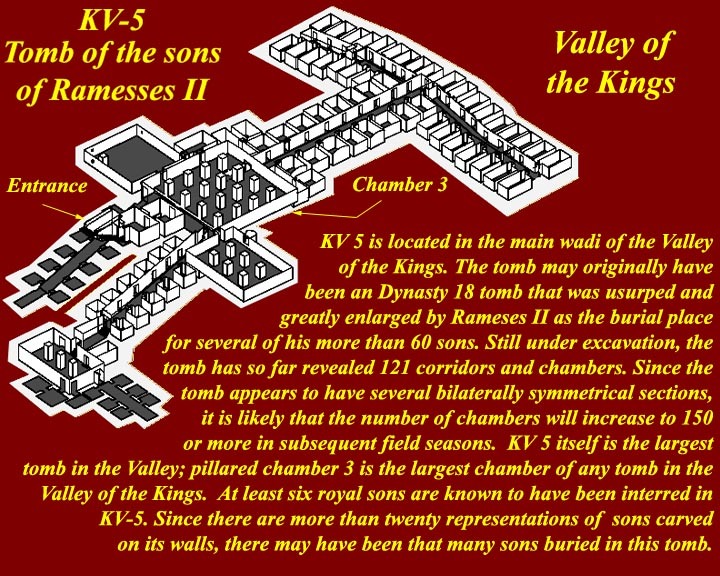 KV-5, the Tomb of the sons of Ramesses II is the biggest in the Valley of the Kings. 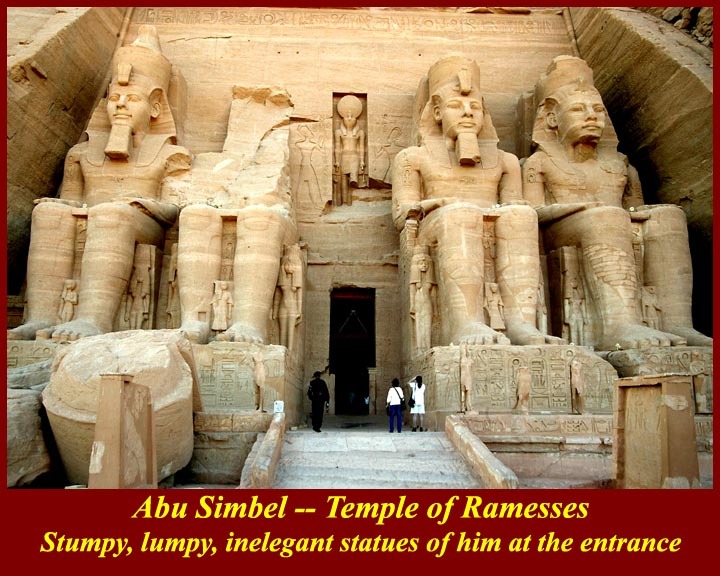 Over the centuries it had suffered the same fate as that of Ramesses I: it was filled with rubble washed down in the flash floods that accompany thunderstorms over the Valley. In addition, it had been robbed in antiquity. 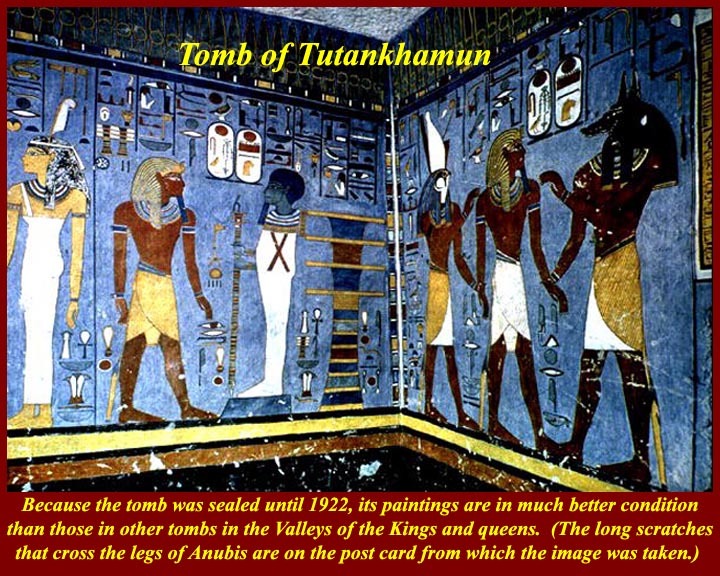 The tomb was examined several times once exploration of the Valley in relatively modern times started, first in 1825 by James Burton and later in 1902 by Howard Carter, discoverer of the tomb of Tutankhamun. Carter used KV5 only as a dumping ground. None of the previous explorers was able to penetrate past the first few rooms, and thus they saw nothing unusual about the tomb. 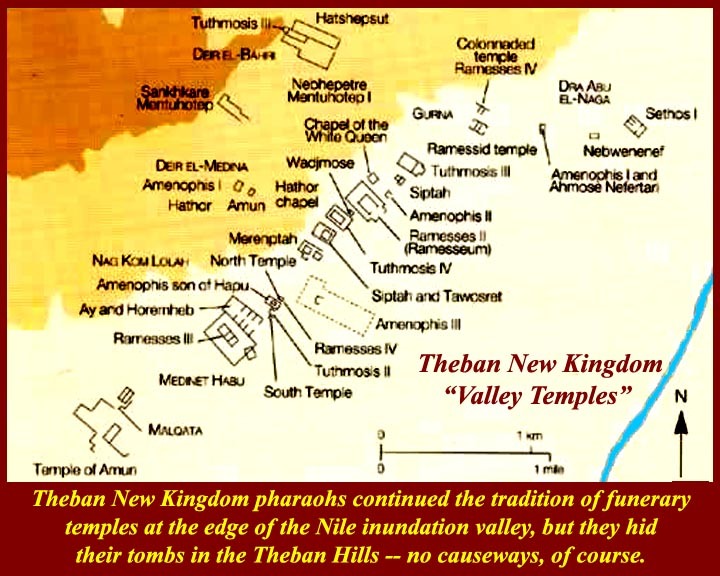 It was not until the Theban Mapping Project, under Kent R. Weeks, decided to clear the tomb that its true nature was discovered. During the initial stages of work, from 1987 to 1994, it still looked like a small and insignificant tomb. In 1995, after doing substantial clearing in the outer chambers of the tomb, the excavators discovered the long corridors, lined with rooms (approximately seventy in all: bear in mind that Ramesses sired at least that many sons), running back into the hillside; a discovery which amazed the world and reignited popular interest in Egyptology. Finds so far have included thousands of potsherds, ushabti, faience beads, hieratic ostraca, glass vials, inlays and even a large statue of Osiris, the god of the afterlife. Further excavations have revealed that the tomb is even larger than was first thought, as it contains more corridors, with more rooms, running off from other parts of the tomb. At least 150 rooms or chambers have been discovered as of 2006, only about 10 of which have been cleared. Work is still continuing on clearing the rest of tomb. It is not yet open to the public and probably won't be for several more years. You can, however, visit the tomb by signing up for Dr. Weeks' fund raising tour in February 2008 -- about $6895.00 plus air fair to Cairo. See http://www.sevenwonderstravel.com/weeks/TMP-registration-pricing-may-2008.pdf. 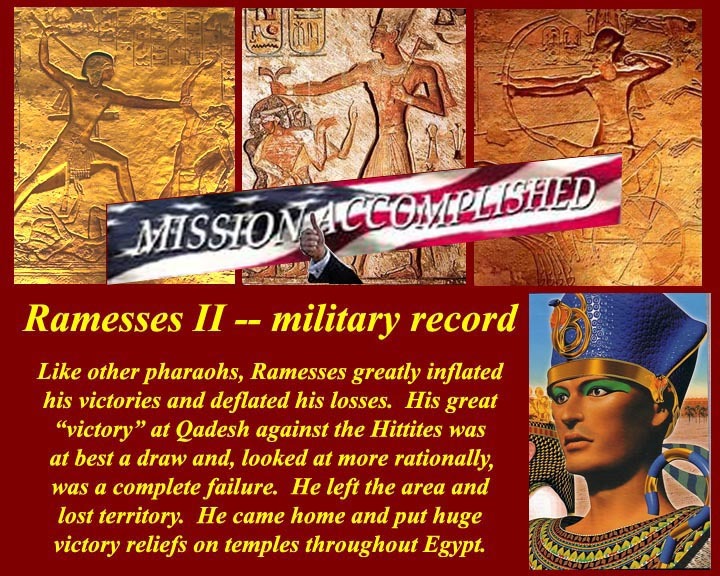 Ramesses portrayed himself as a great military commander, but history says otherwise. His biggest "victory", at Qadesh was a sham. 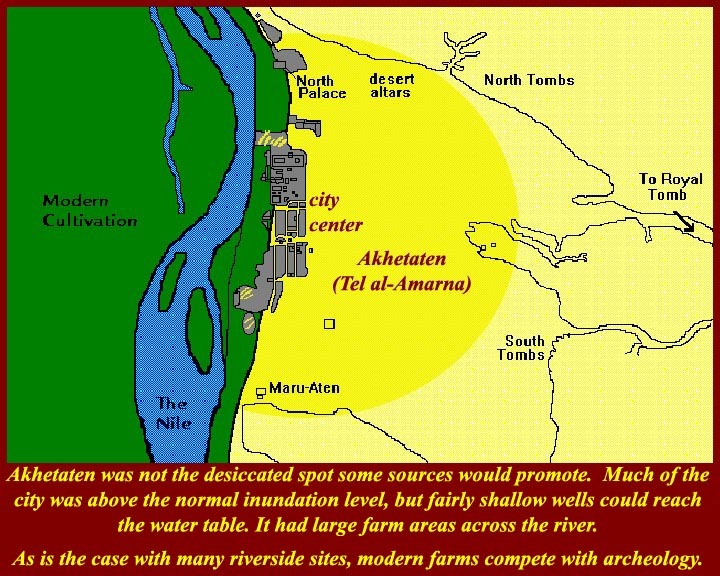 For what actually happened at Qadesh, see http://www.militaryhistoryonline.com/ancient/articles/kadesh.aspx. What? You never heard of Pharaoh Nectanebo I? He was the first pharaoh of the 30th Dynasty, which lasted from 380 to 343 BC. 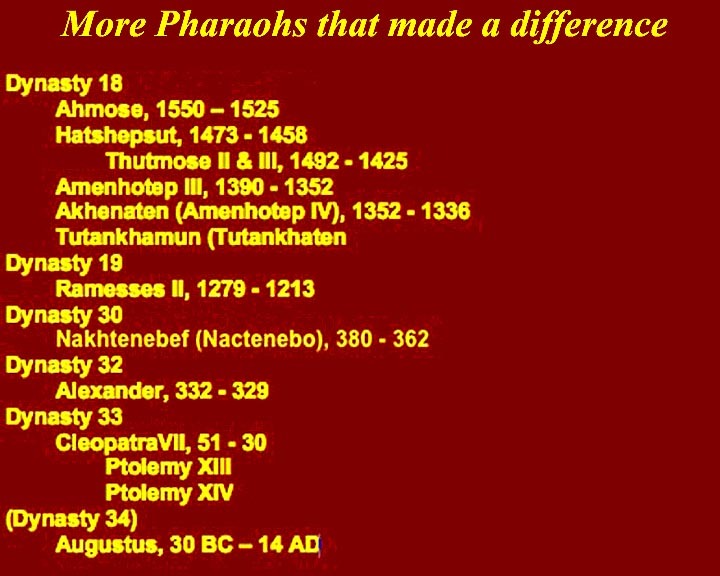 There were only three pharaohs in that dynasty, and it was the last dynasty to have Egyptian rather than foreign pharaohs. 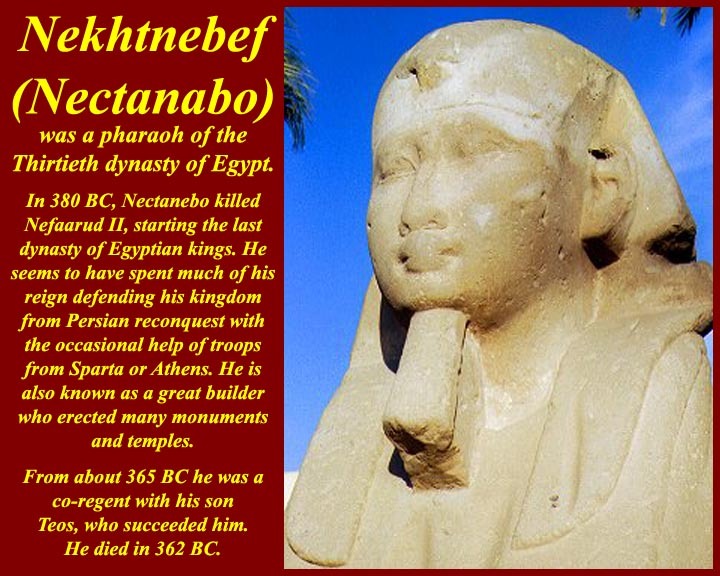 Nectanebo was how the Greeks referred to him, but his Egyptian name was Nekhtnebef. His tenure was based on a squabble between Greeks and Persians who tried to cooperate to take over Egypt in 373 BC. The Greeks and Persians argued over whether to take the then Egyptian capital, Memphis, and, when they finally did move, they got bogged down in the mud of the July 373 inundation and had to retreat. The Persian-Egyptian alliance broke down and they all went home. The Persians, who were the potential super-power in the area, then spent many years in internal dynastic infighting. 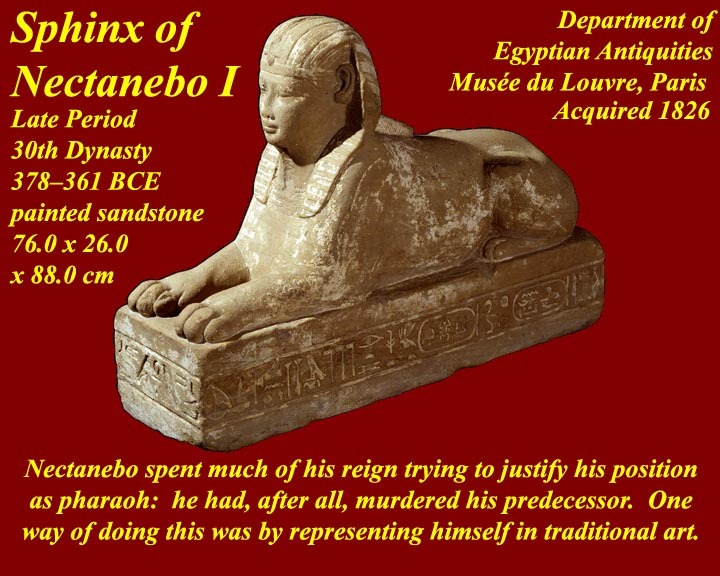 Nectanebo was the pharaoh who "defended" Memphis and "chased away" the invaders -- at least according to his propaganda machine. One of the things that endeared Egyptian pharaohs and gave them credibility with their people was taxes and tax enforcement. Without the pharaoh's enforcement of regulated taxes, the people would be exploited by local officials. A pharaoh who set nationwide fair taxes and posted them so everyone could see them was considered a defender of the rights of the people (even though the people might still complain about the tax rates). Nectanebo was the first pharaoh in a long time to post the tax rates and conditions throughout Egypt on duplicate steles like this one found intact at Naucratis (Kratj). 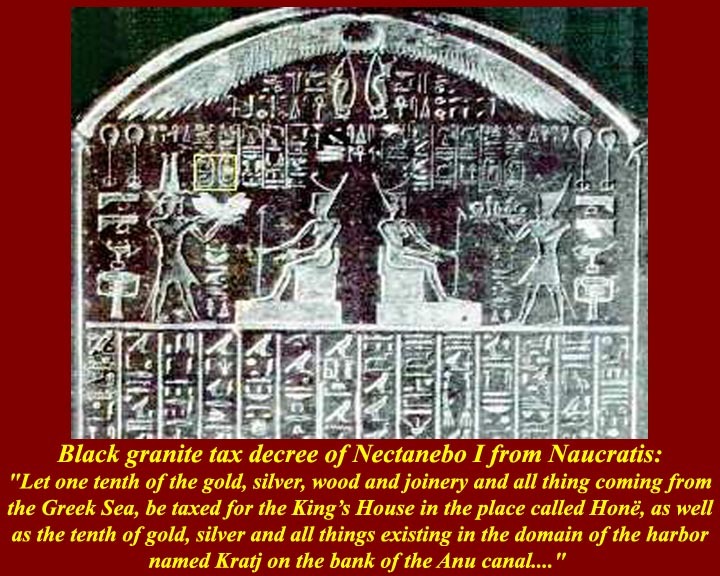 The imagery of the stele is especially important: it shows the pharaoh receiving taxes from both the producers (left) and the importers from "the Greek Sea": the locals were being protected from cheap foreign imports. Nectanebo also endowed new buildings on important temple areas. 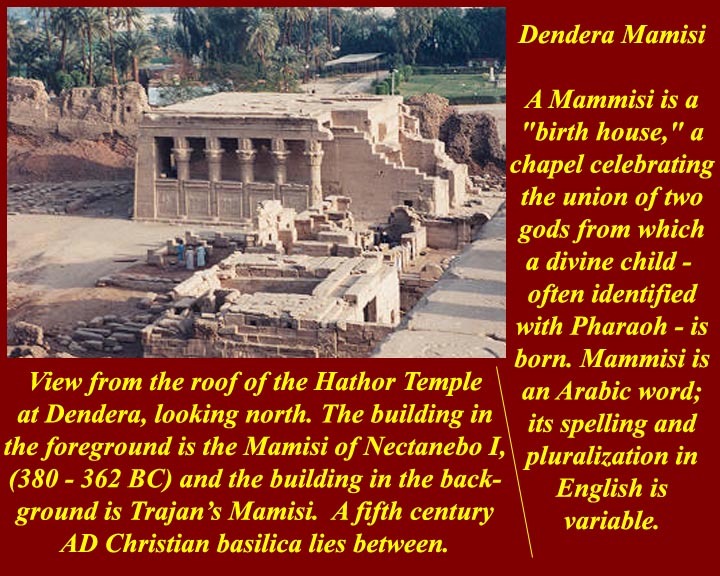 At the great Hat-Hor temple in Dendera he built a "mamisi", supposedly a place celebrating the union of two gods to produce a divine child, who is often identified as the pharaoh. Hat-hor temples celebrated childbirth (the cow and milk for the kids) so a mamisi at her temple was especially important. 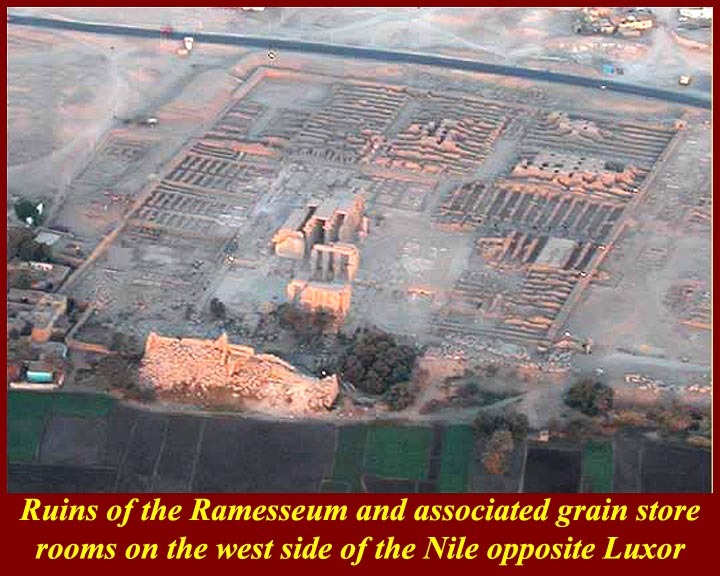 The image shows three buildings: in the foreground is Nactenebo's mamisi, in the background is another mamisi built by Trajan (who, like Nectanebo was probably motivated by public relations) and in between are the ruins of a Coptic Christian basilica church. Incidentally, the basilica architectural style is often thought of as a Greek, Roman, or Christian invention, but the first structures built on the plan of a nave with side aisles and clerestory windows were, in fact Egyptian hypostyle halls, a prime example being the great hypostyle hall at Karnak. The Greeks, Romans, and Christians all saw Egyptian basilicas before they built any of their own. And -- the word basilica comes from the Greek phrase basilik oikía, which meant royal house, which could be translated into ancient Egyptian a peraoh, which the Greeks wrote as pharaoh. 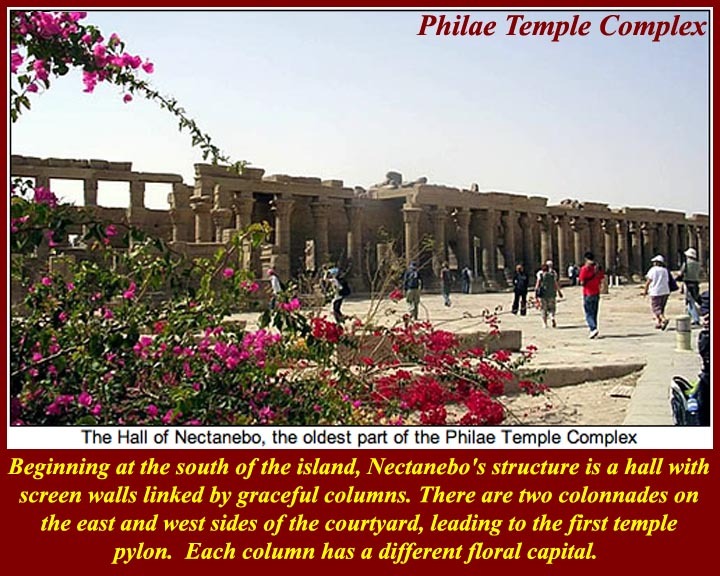 In addition to embellishing existing temple complexes, Nectanebo is credited with starting the new complex on Philae Island. Everything on the island was moved to a nearby higher island in the 1970s to avoid the rising waters between the Old Aswan Dam and the Aswan High Dam. 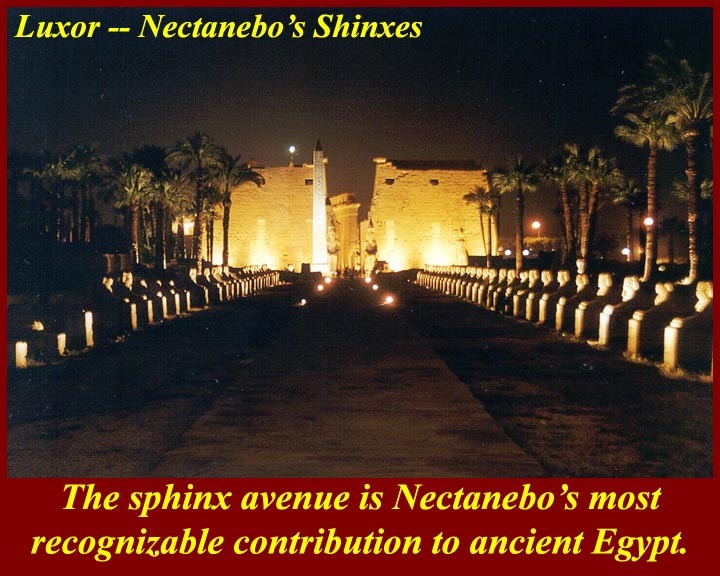 Nectanebo is also responsible for one of the icons of ancient Egypt -- more sphinxes along the avenue of the sphinxes before the First Pylon at the Luxor Temple complex. They are all in the style of sphinxes of his time: rather than being recumbent, their shoulders and back are raised. And they all have his face, and his name is inscribed on the base of each. 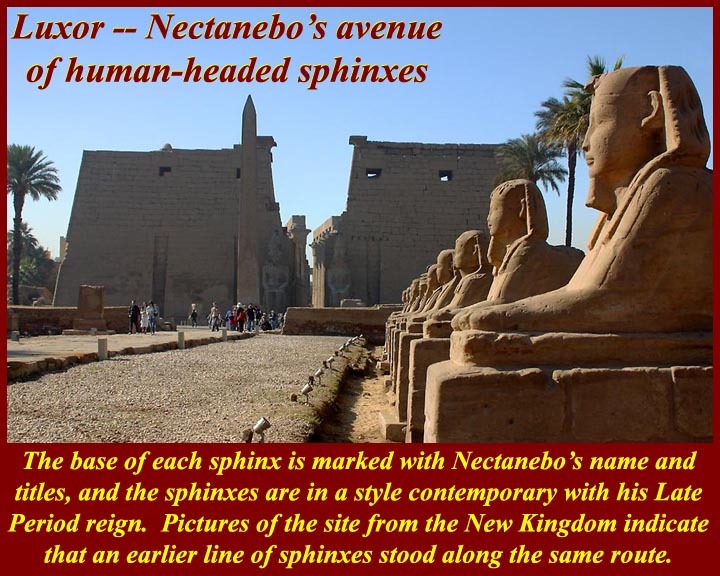 There are, indeed, pictures of an avenue of sphinxes at the site that date from before Nectanebo's time, but nobody knows where they might have gone. The sphinxes there now are certainly his. The 30th Dynasty was ousted in 343 BC when the Persians returned. They and the Libyans and the Nubians had provided all of the pharaohs of the Third Intermediate Period and of the Late Period except for those of Nectanebo's 30th Dynasty. The three Persian pharaohs that reigned after 343 were considered tyrants by the Egyptians -- they exploited Egypt for the benefit of Persia. When Alexander chased out the Persians and installed himself as pharaoh in 332 BC he was received as a savior of Egypt. The great Alexandrine, Ptolemaic, and Roman pharaohs will be covered in a later unit.